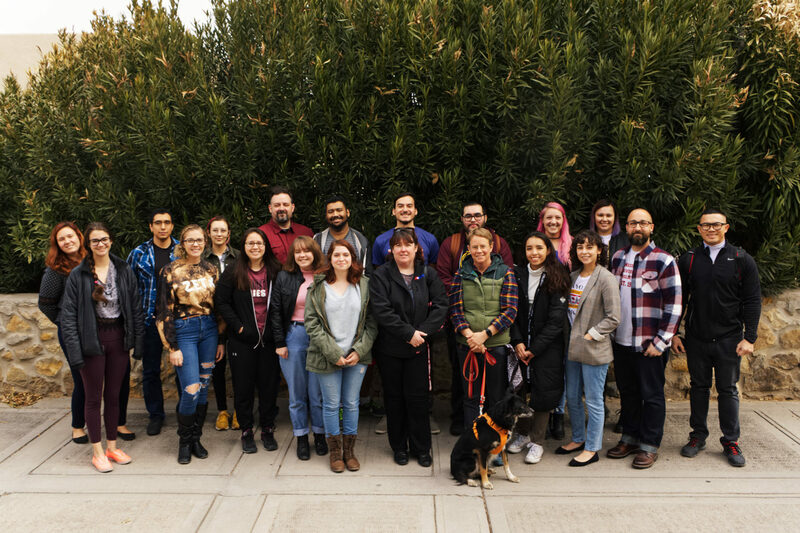 Just missing a few people from our lab in this photo. 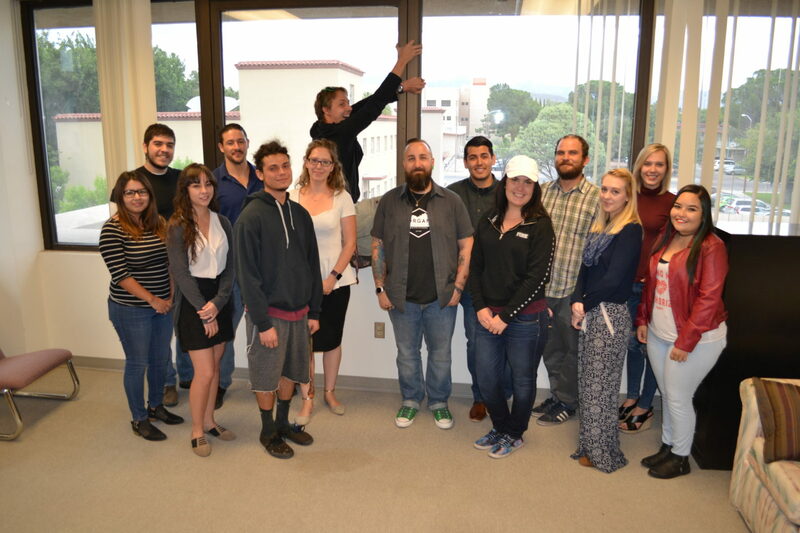 Great group of grads and undergrads in the VSM Lab! 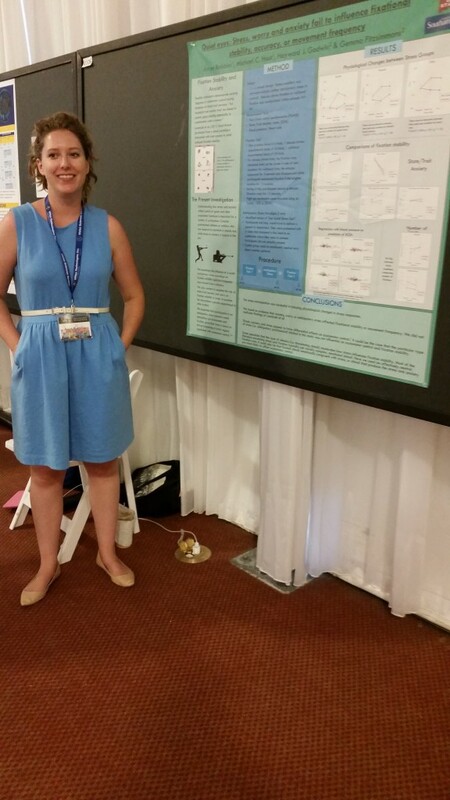 Rebecca presenting her first poster on search and rescue research. Collin presenting his computational model of visual search. 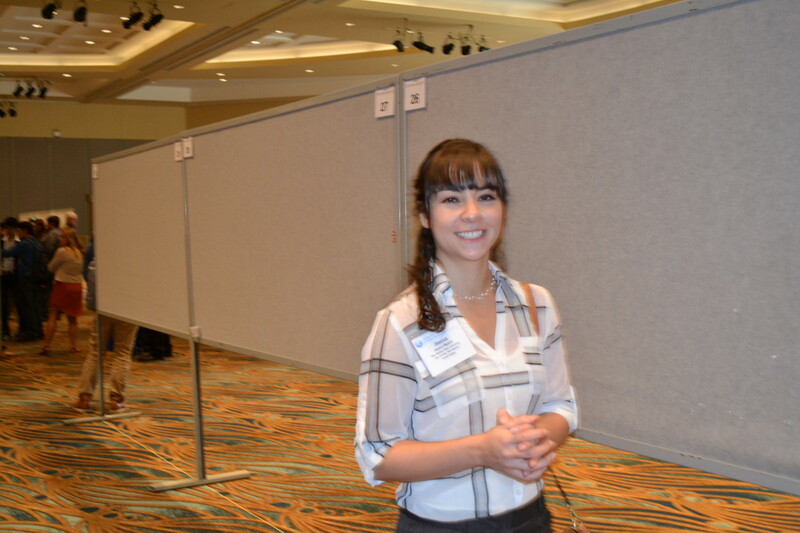 Jessica presenting one of the pair of posters she presented; this one on object recognition. Our conference group for the year. 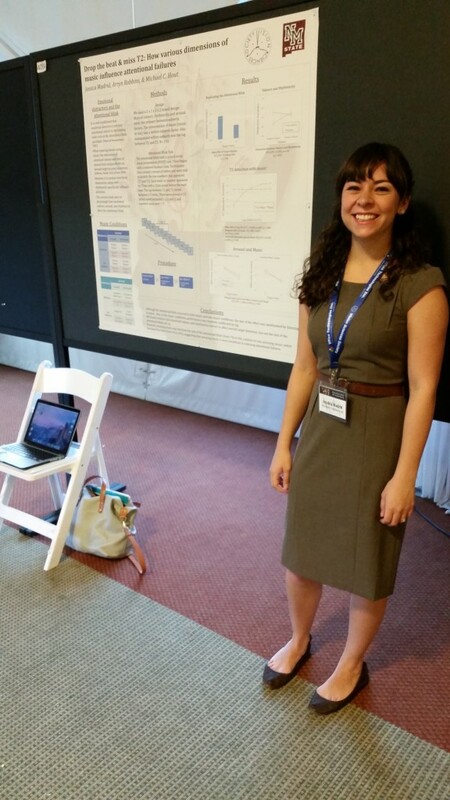 Audrey presenting our research on transcranial direct current stimulation and auditory processing at the symposium. 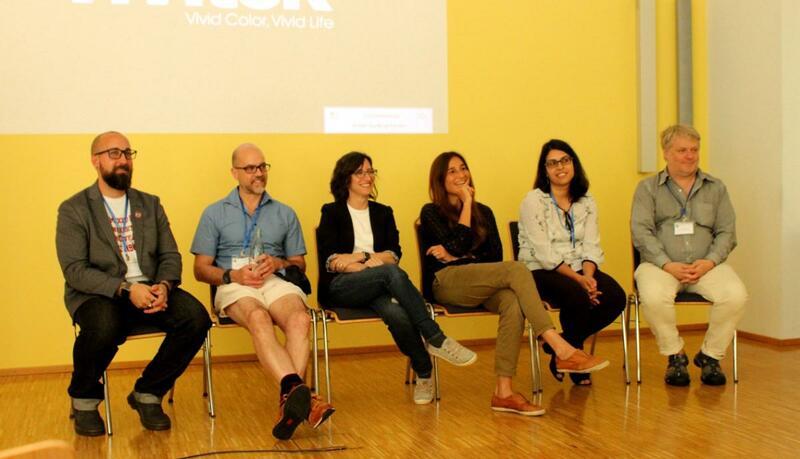 Panel discussion following our group of speakers. 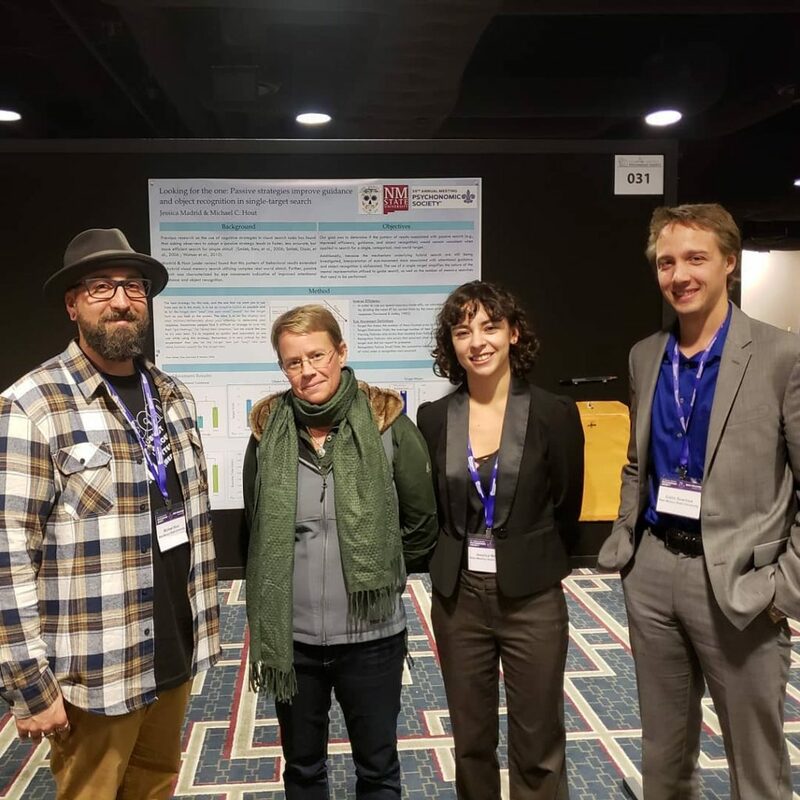 Left to right: me, Greg Zelinsky, Ruth Rosenholtz, Melissa Le-Hoa Võ, Monica Castelhano, and Arni Kristjánsson. 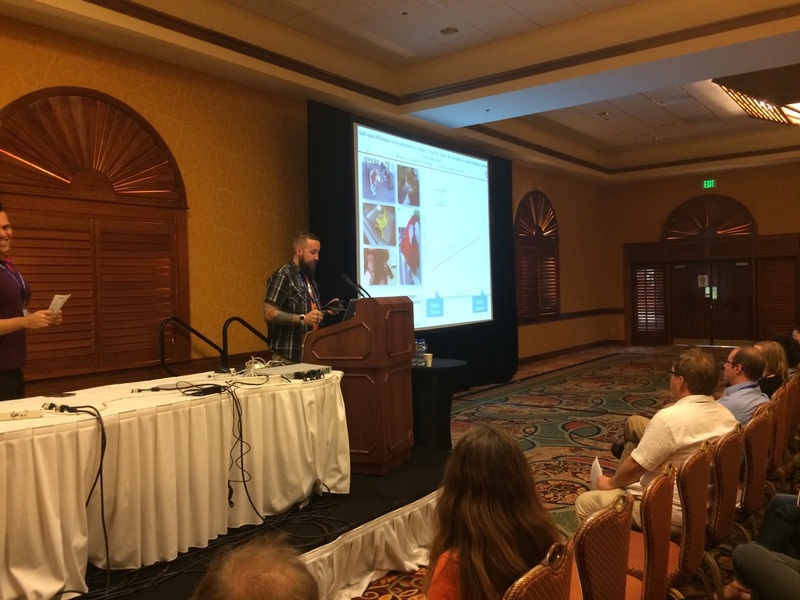 Presenting my talk on the last day of the conference. 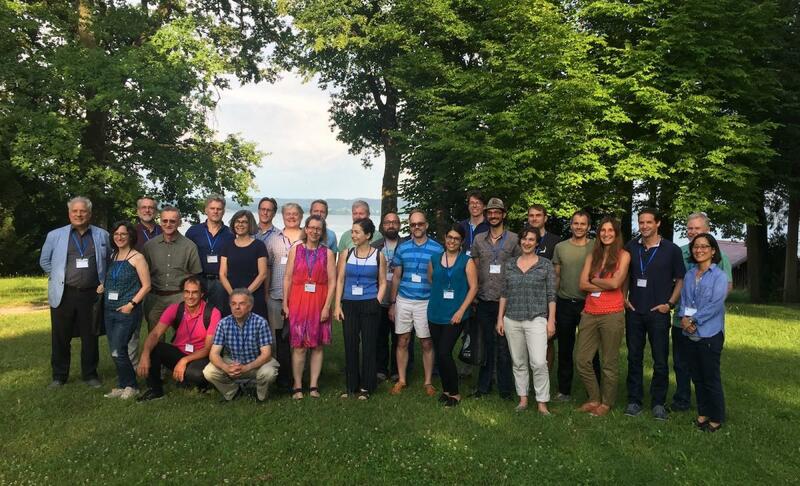 Group photo (of all invited speakers) on the edge of Lake Ammersee. 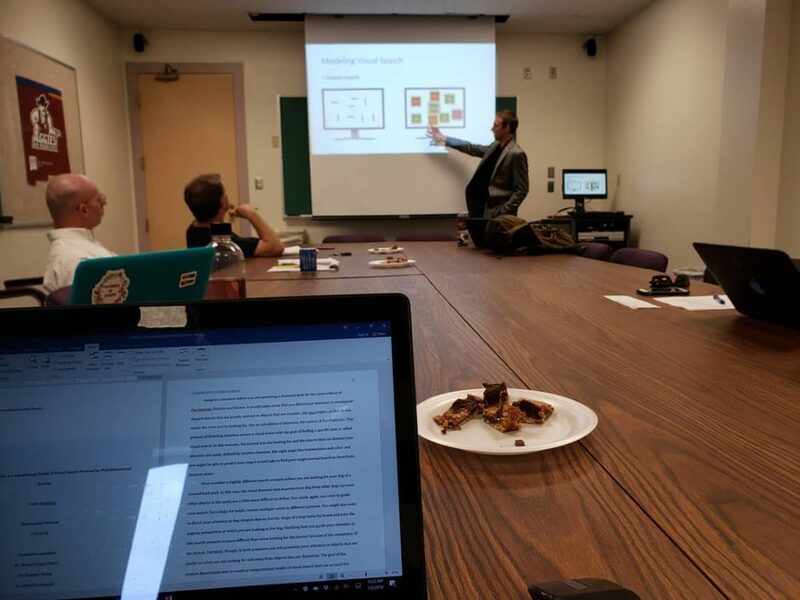 Collin has successfully defended his PhD, and I couldn’t be happier. 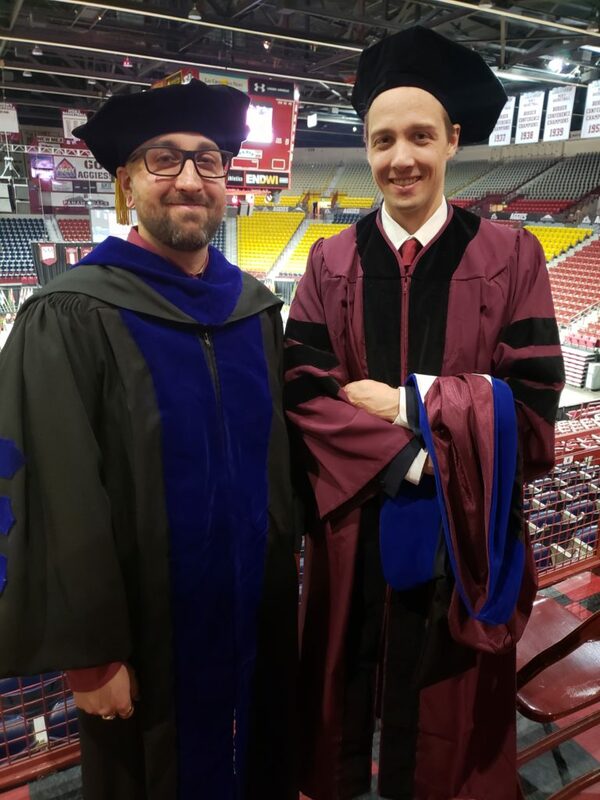 I’m very proud of the work he did for his dissertation, and know he has a bright career ahead of him. This is him at the start of his defense, July 9th, 2018. 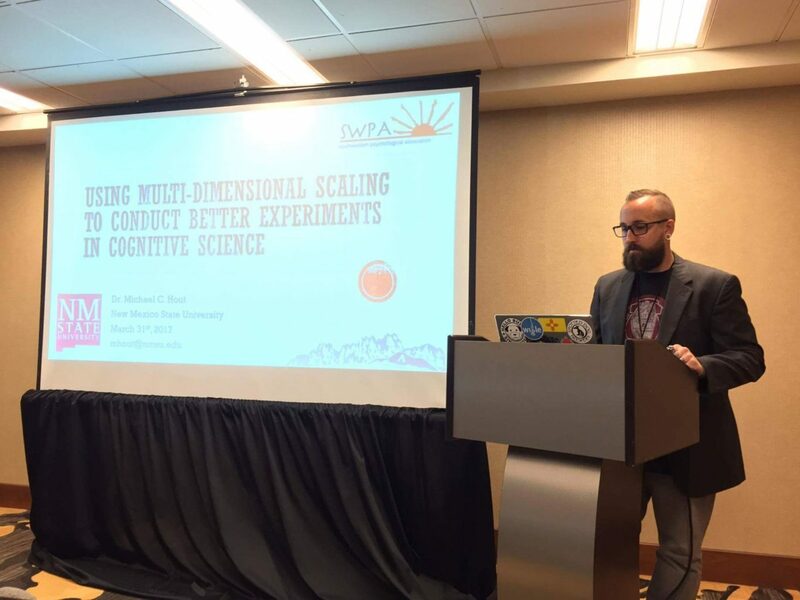 I was recently invited (by the Environmental Neuroscience Laboratory: http://enl.uchicago.edu/) to speak at the University of Chicago. 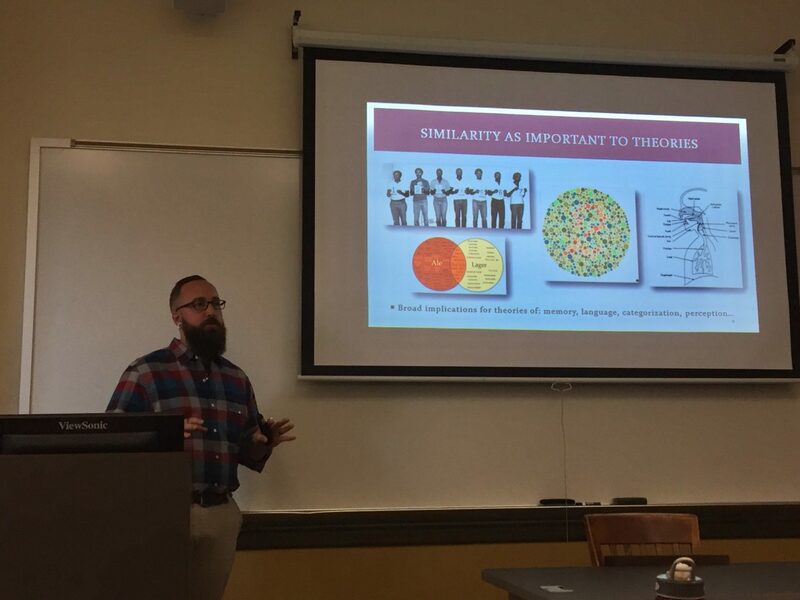 I spoke about our recent work on strategy use in visual search to a wonderful group of academics (faculty and graduate students alike). I couldn’t have been happier or more proud than to see Dr. Robbins complete her degree. This is her at her defense, and her and I at her doctoral hooding, May 11th, 2018. 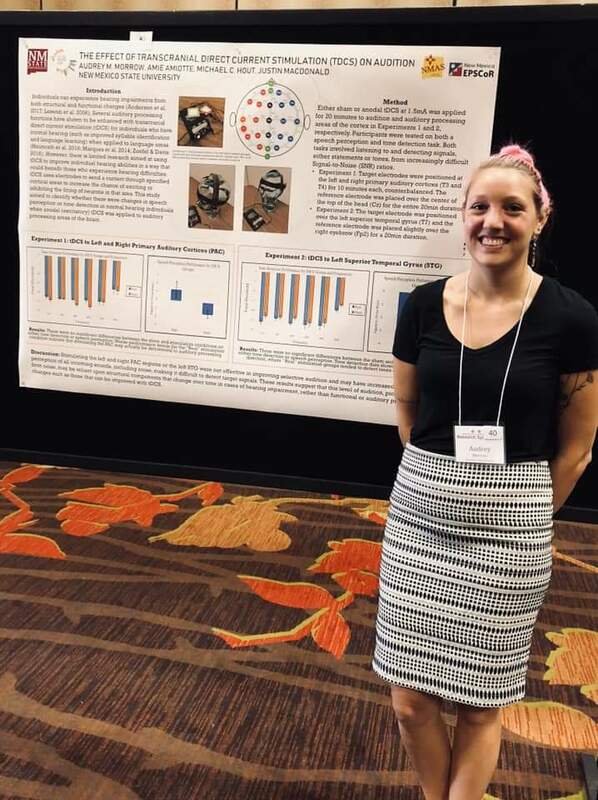 Emily Green, an honors thesis student working in our lab, presenting our incidental memory research at this year’s URCAS conference. 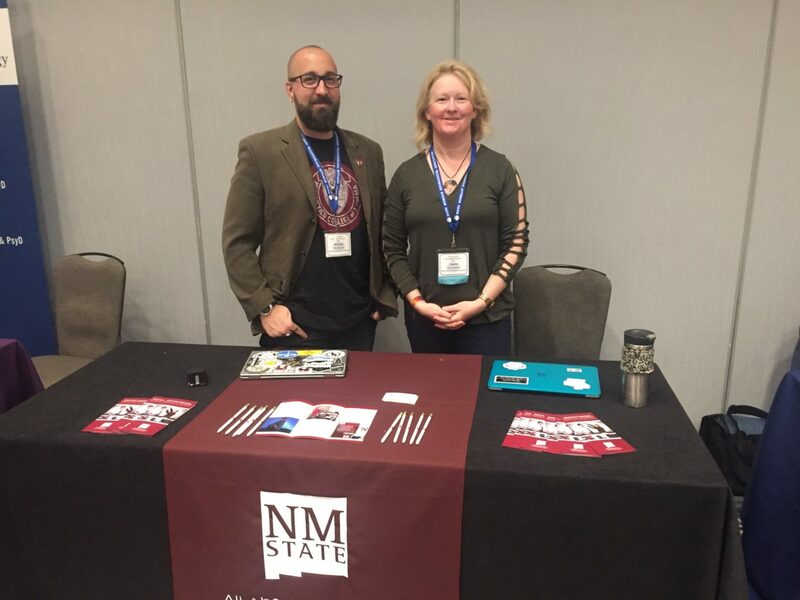 Dr. Laura Madson and I at our NMSU recruitment table. 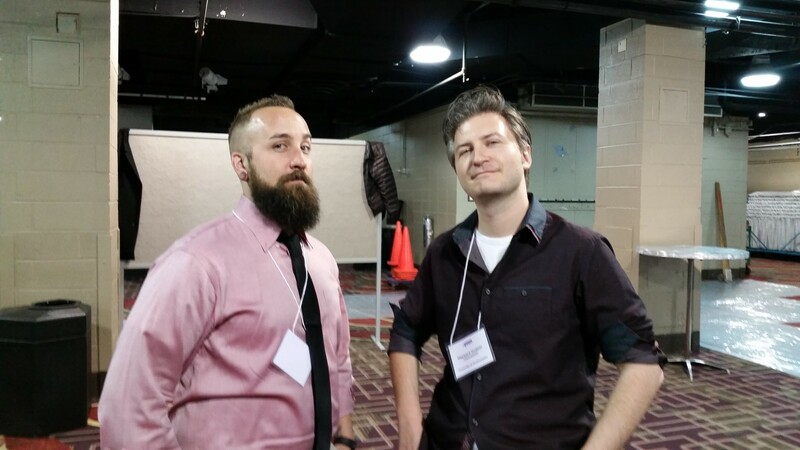 We had a lot of conversations with potential new grads! 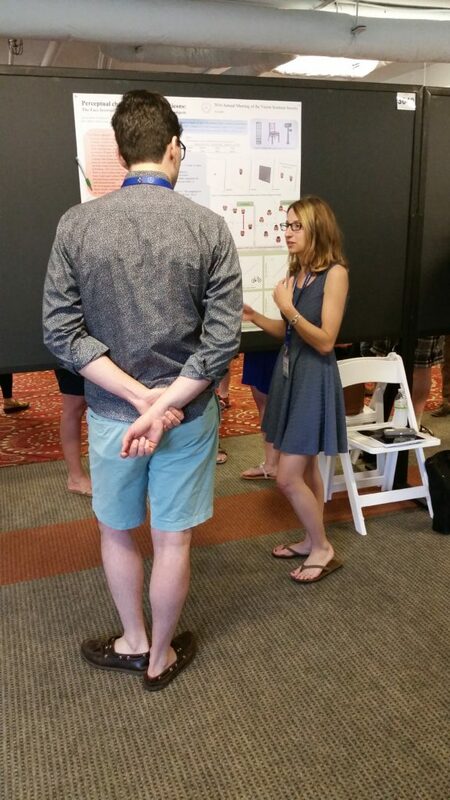 Arryn presenting our research on the influence of scene context during categorical visual search. 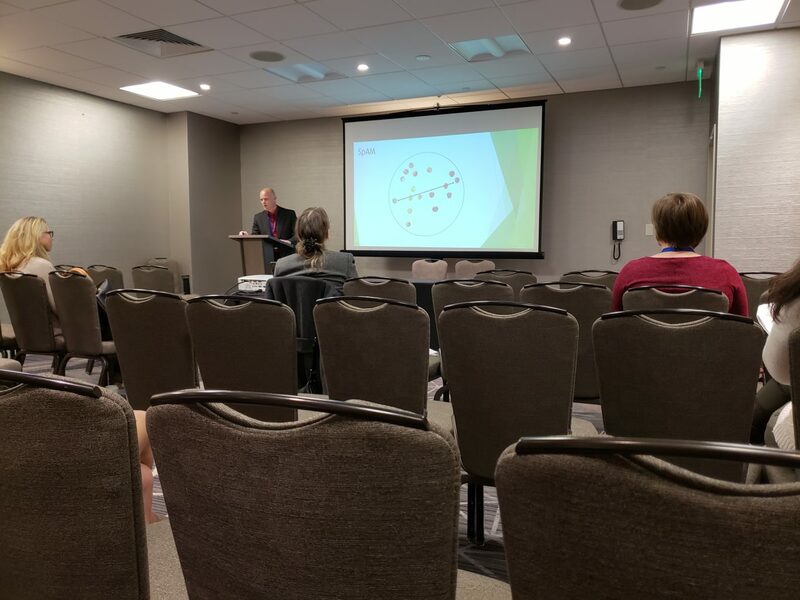 John Kulpa presenting our research on the best ways to collect similarity data. 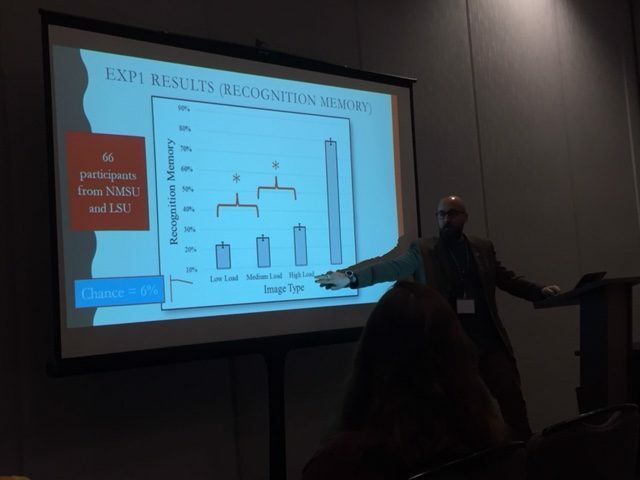 Me presenting our research on incidental memory during visual search. 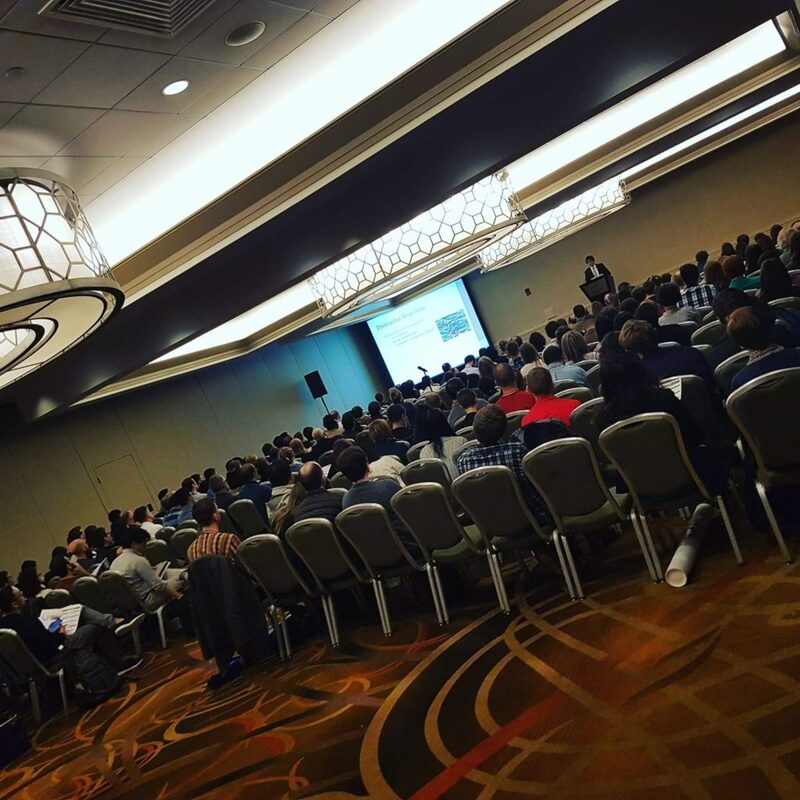 Collin presenting his talk to a packed room on the first day of OPAM. 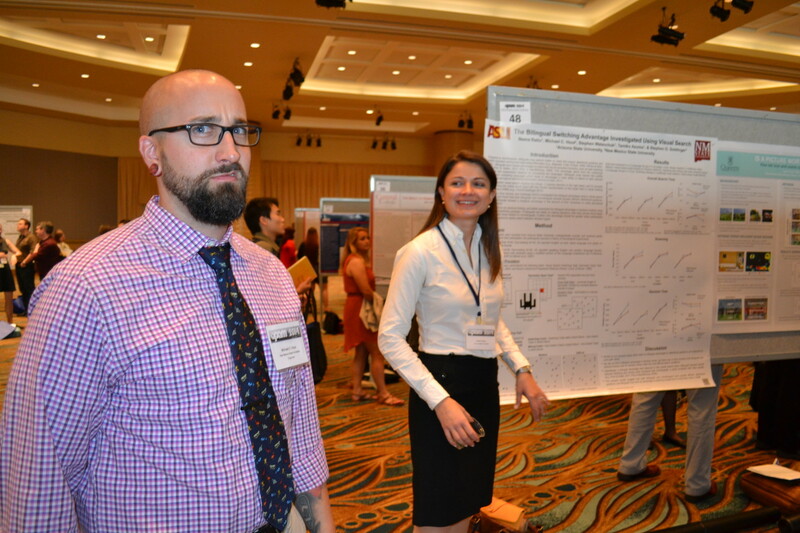 JMad killing it at her Psychonomics poster, talking hybrid search with Carrick and the Big Bad Wolfe. 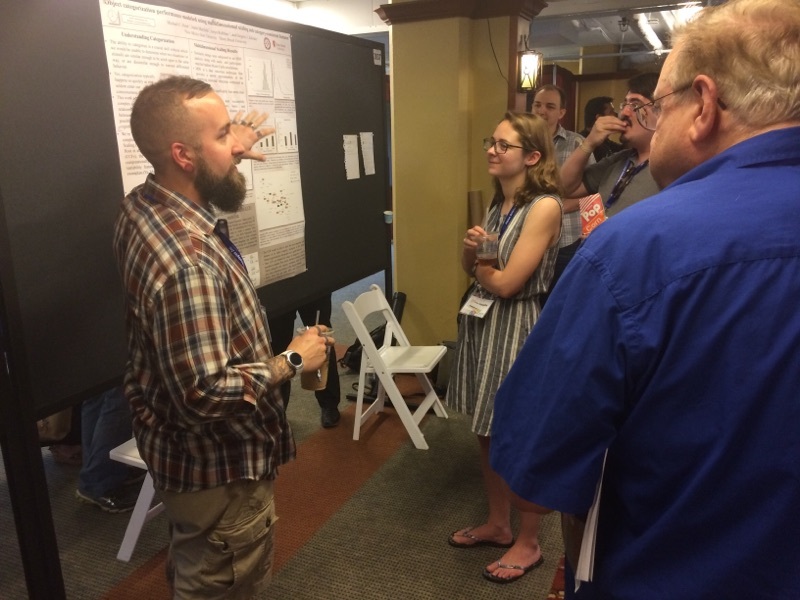 Me presenting John’s “Google Effect” poster at OPAM. 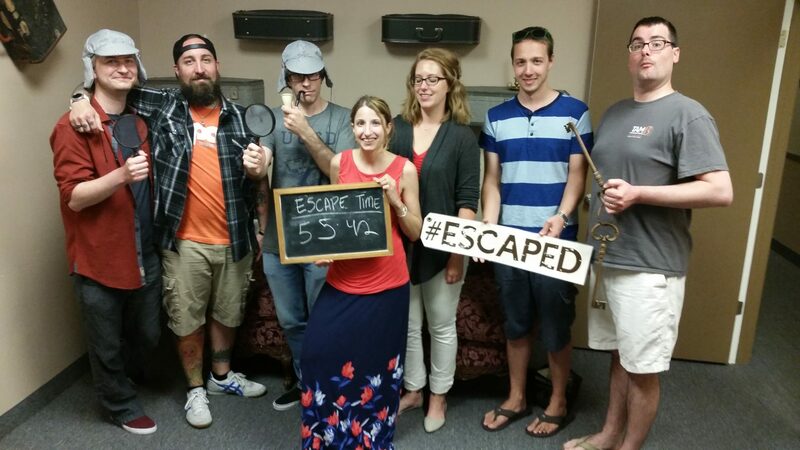 At least we somehow managed to get Collin and Summer in on this one. 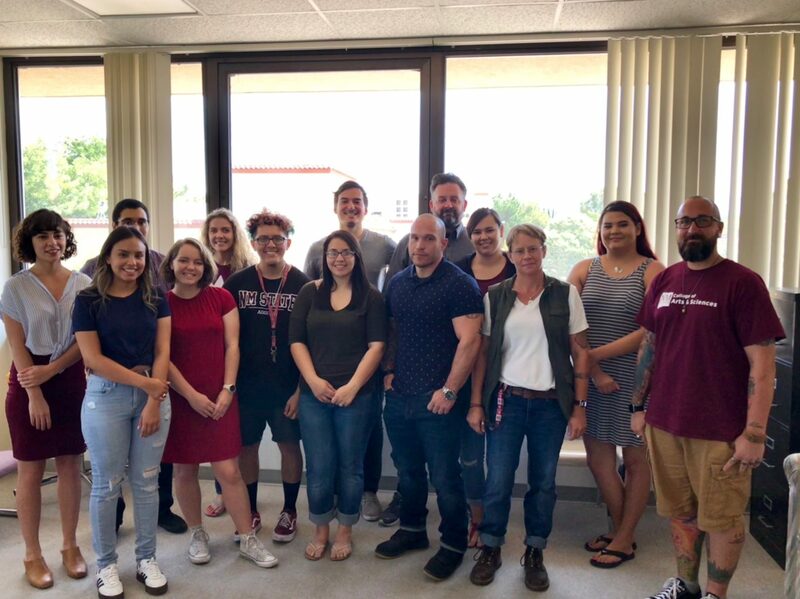 Never let Michael Marks (and his shaky hands) take your annual lab photo. Missing several people, sadly. 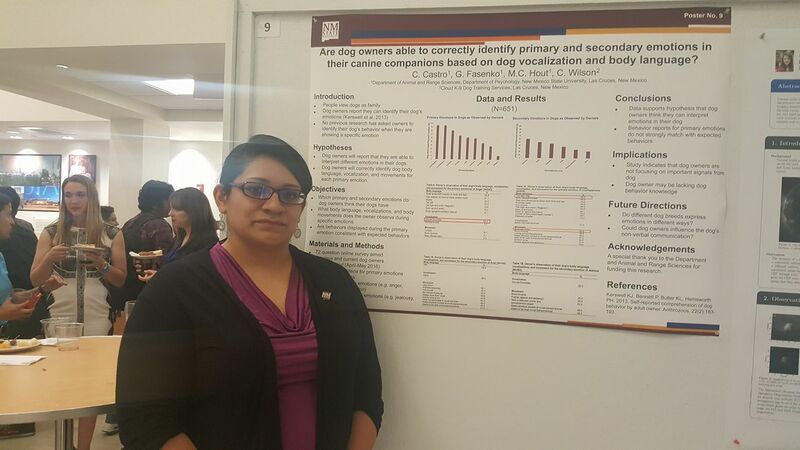 Ms. Belle Castro (who recently completed her master’s degree), presenting the research she did in collaboration with Dr. Gaylene Fasenko and myself, at GRAS. Belle’s research focuses on how well people are able to interpret and understand primary and secondary emotions in their dogs. 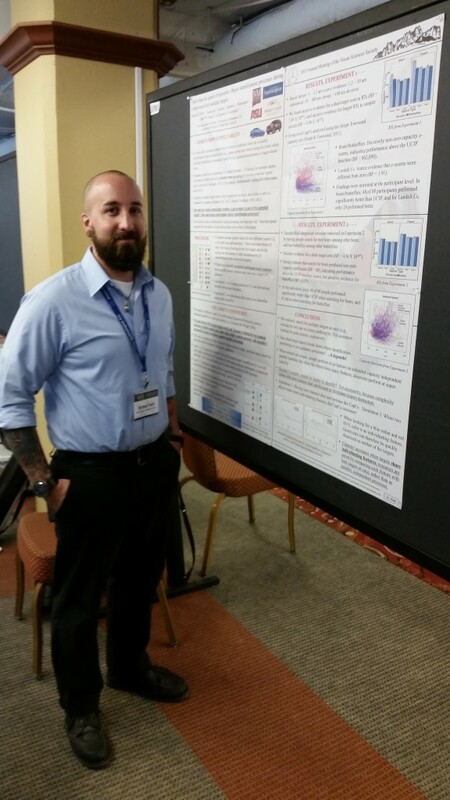 Mr. John DesGeorges, an undergraduate Discovery Scholar working in my lab, presenting his research at URCAS. 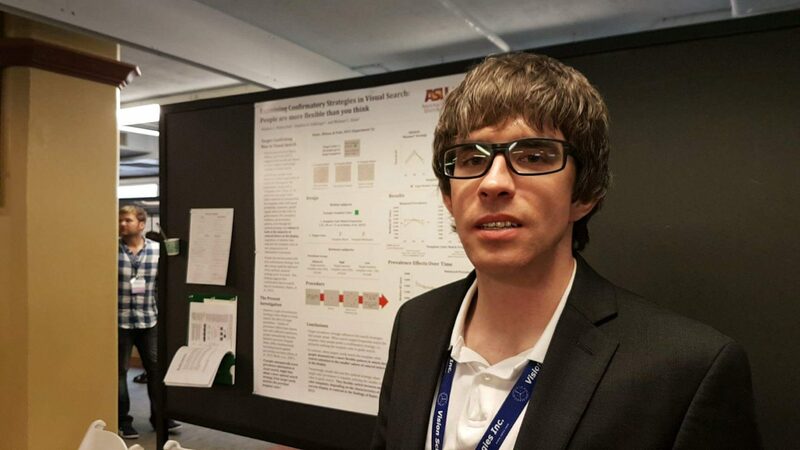 John’s research is on transactive memory, and how people are primed to think of computer-related things when faced with difficult informational demands (or are they?). 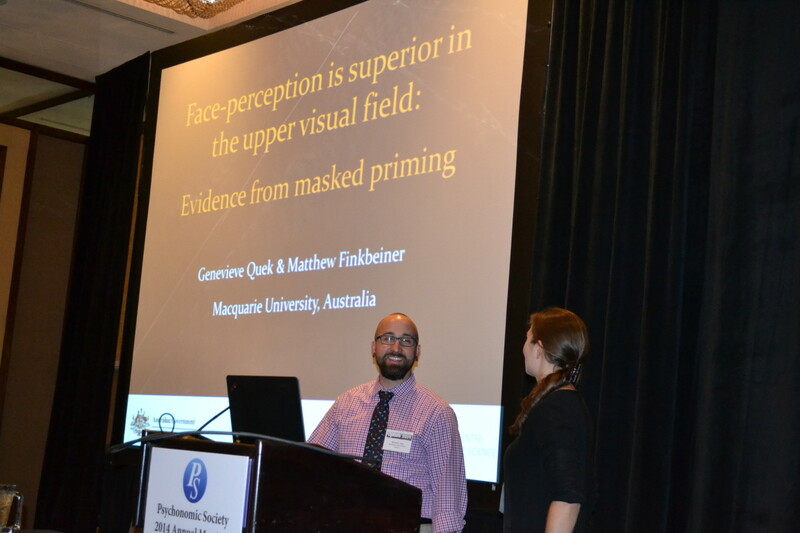 Steve Walenchok presenting our talk on confirmation bias in visual search. 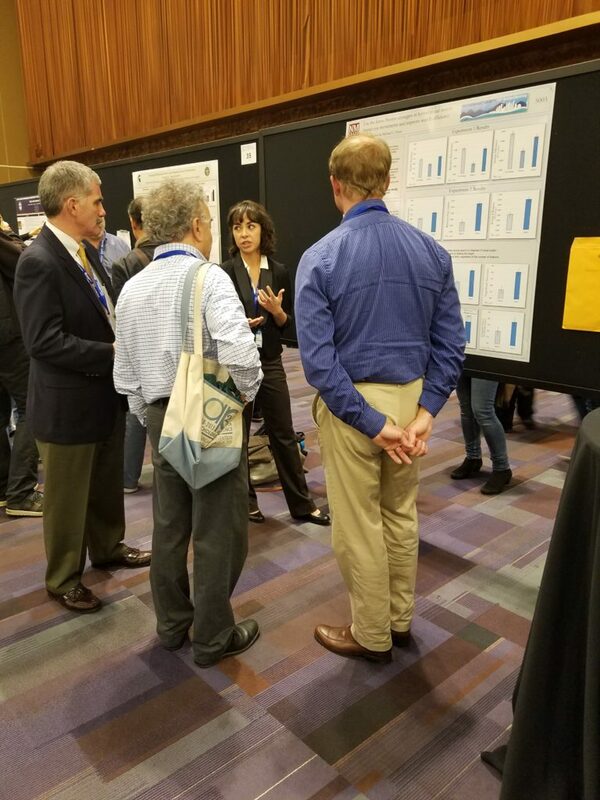 Presenting my invited symposium on using MDS to conduct better experiments. 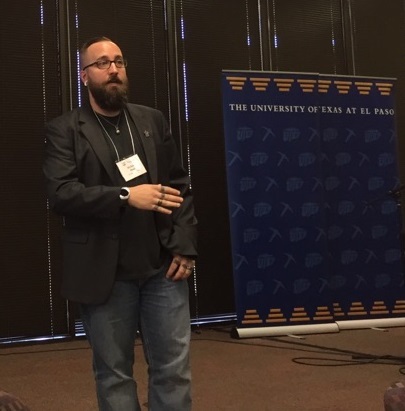 Quick snapshot from the invited talk I gave to the Psychology department at the University of Arizona in February (2017). 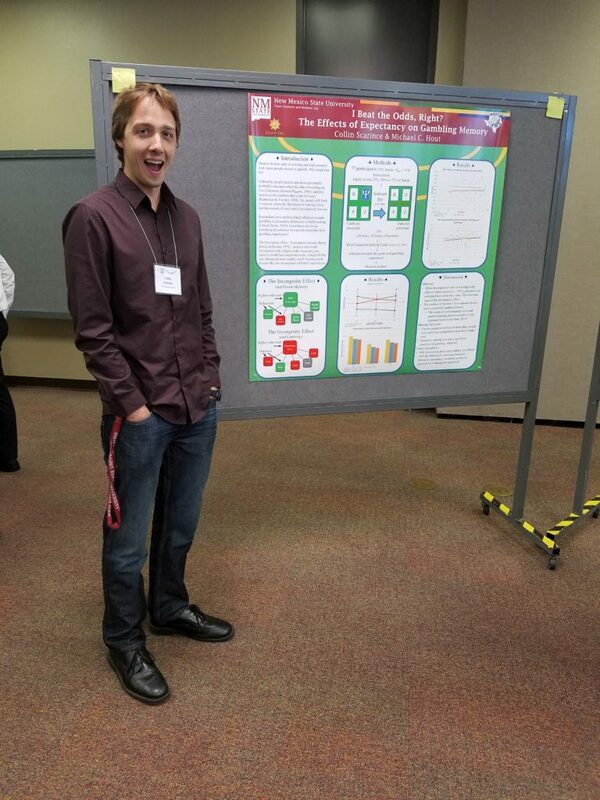 Me, presenting my workshop (on multidimensional scaling) at LSU. 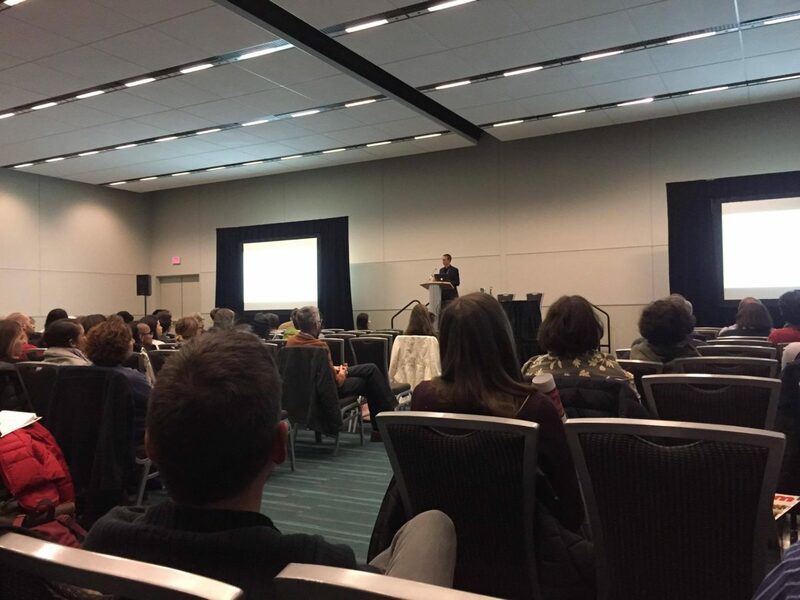 Steve Walenchok’s very well attended talk (on decision-making in visual search) at OPAM. 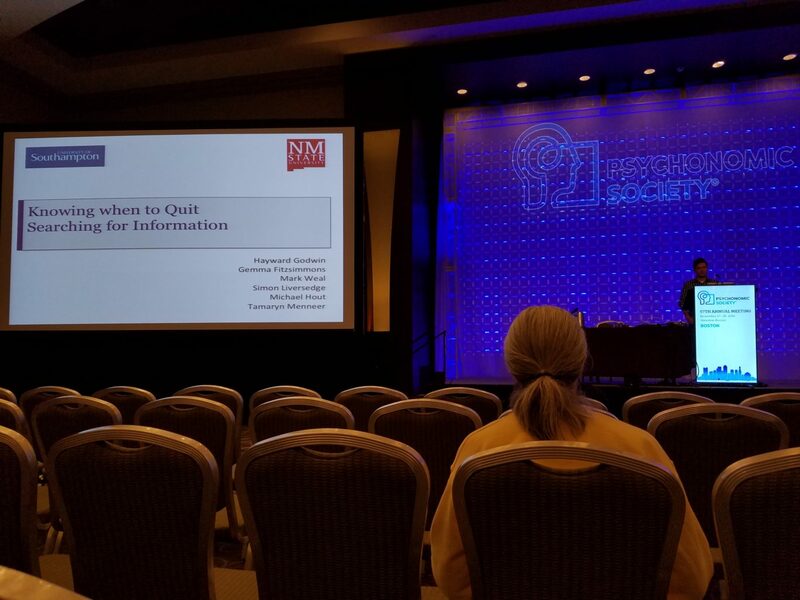 Hayward Godwin presenting our talk (on searching for information) at Psychonomics, followed shortly thereafter by pyrotechnics and accompanied by backup singers. 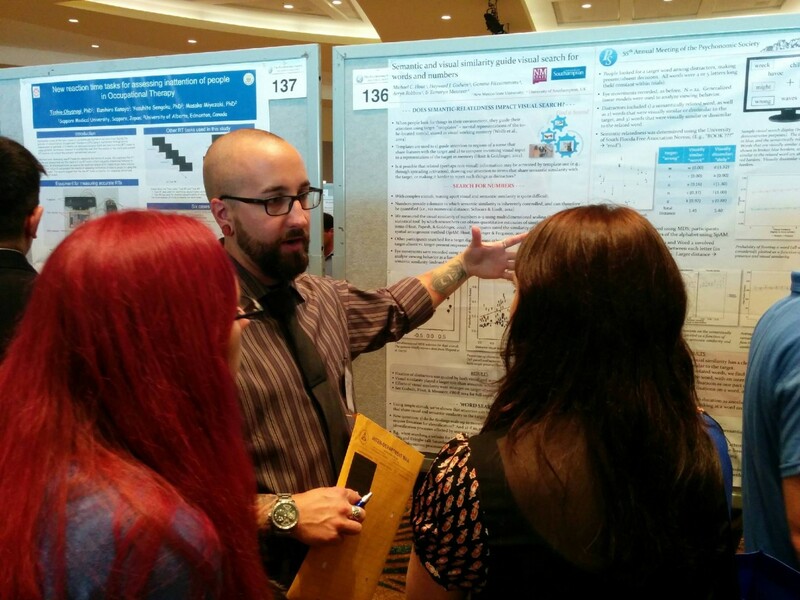 Me presenting my poster (on visual search expertise) at Psychonomics. 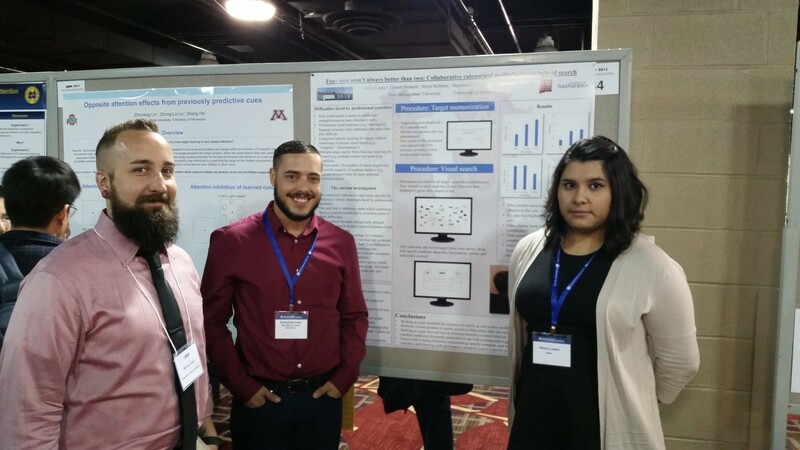 Alexis Lopez presenting our poster (on collaborative visual search) at OPAM. 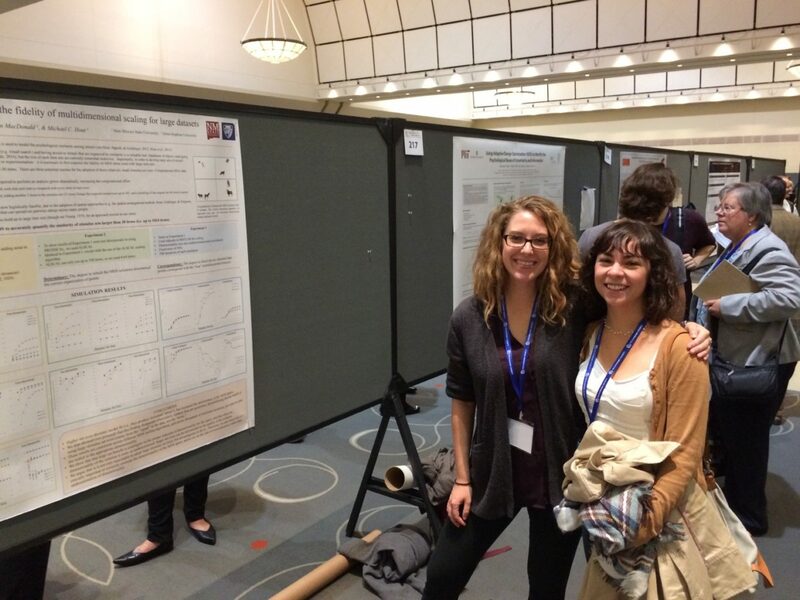 Arryn Robbins (with Jessica Madrid) at her poster (on multidimensional scaling simulation work) during Psychonomics. 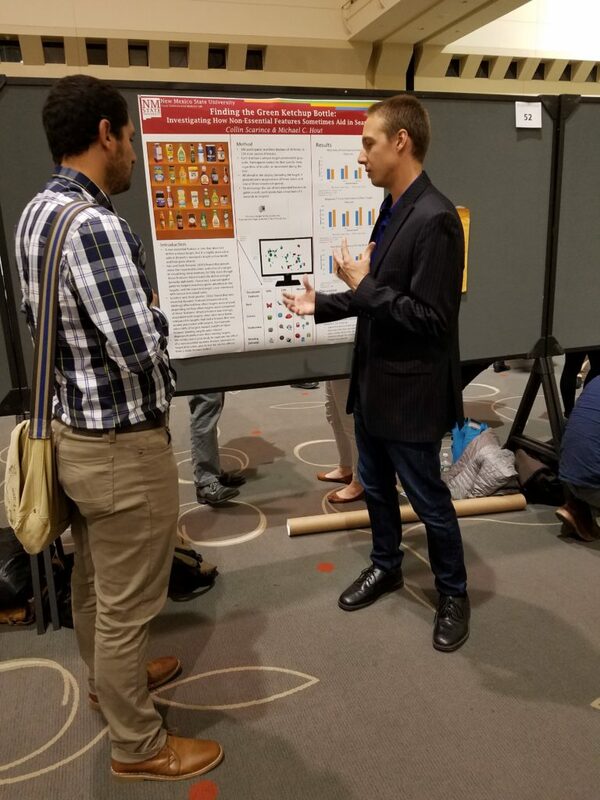 Collin Scarince presenting our work (on non-essential features in visual search) at OPAM. 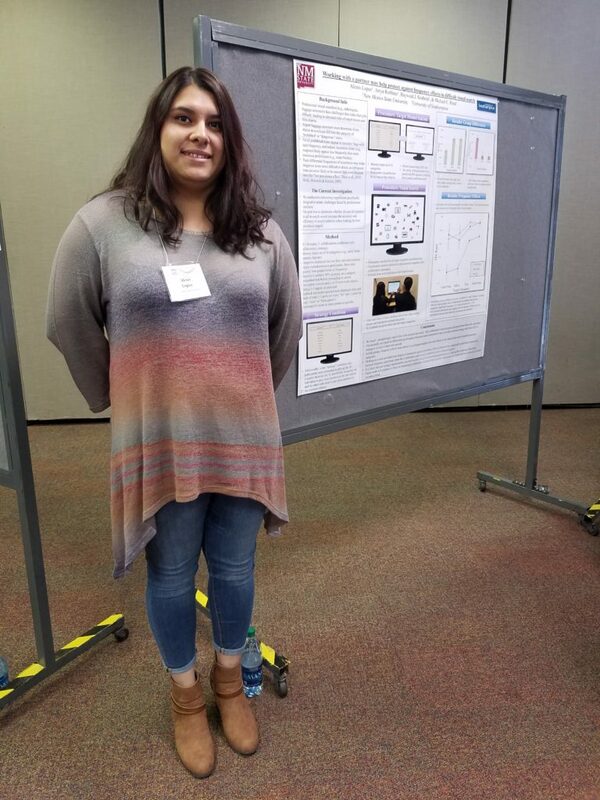 Jessica Madrid at her poster (on hybrid visual search) during OPAM. 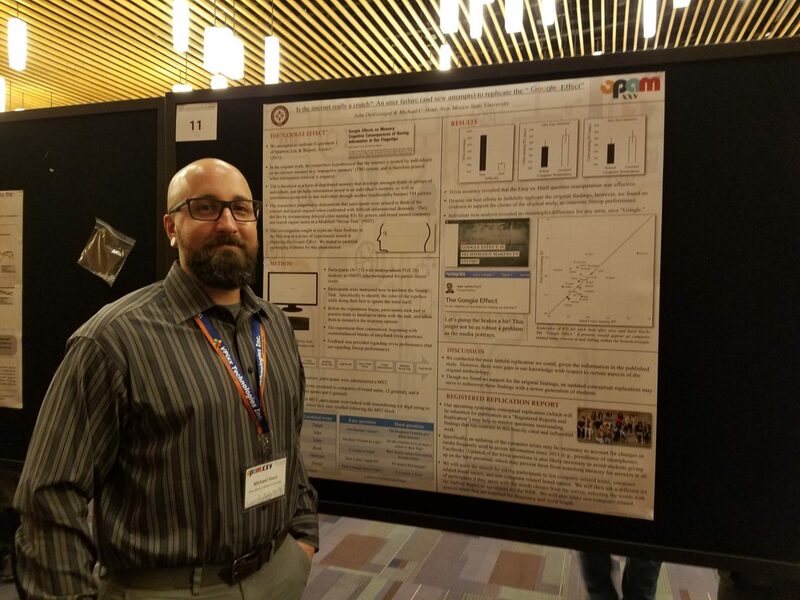 Steve Walenchok presenting our poster (on strategies in visual search) at Psychonomics. 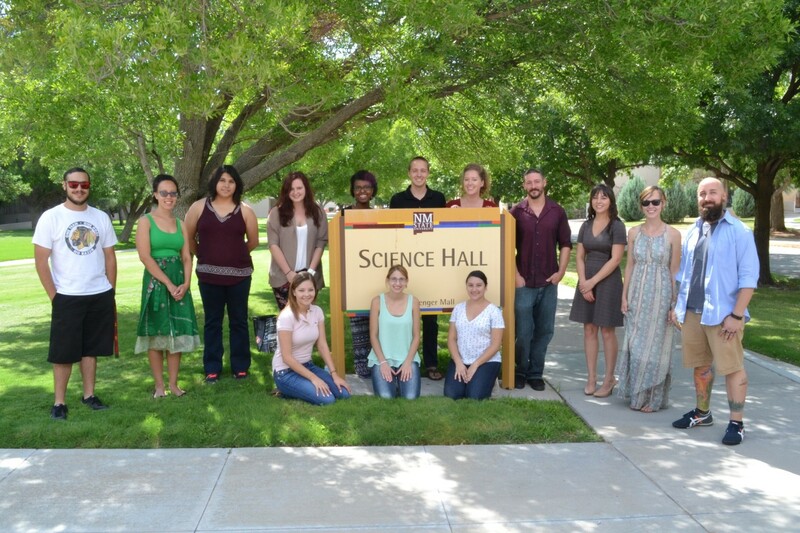 Sadly, due to the rain, we only got a single lab photo this year! And without a tree to climb, Collin was resigned to climbing, um, the walls. 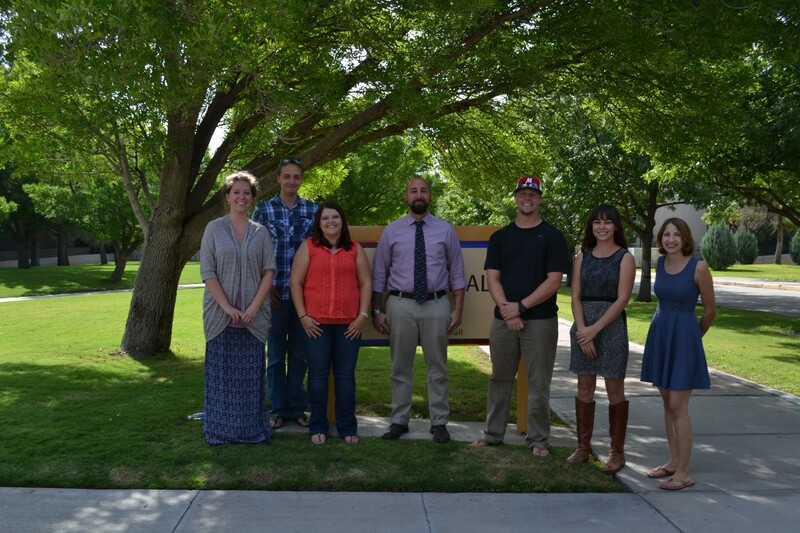 Shown are my wonderful graduate students, and many of the research assistants on whom we so critically rely! 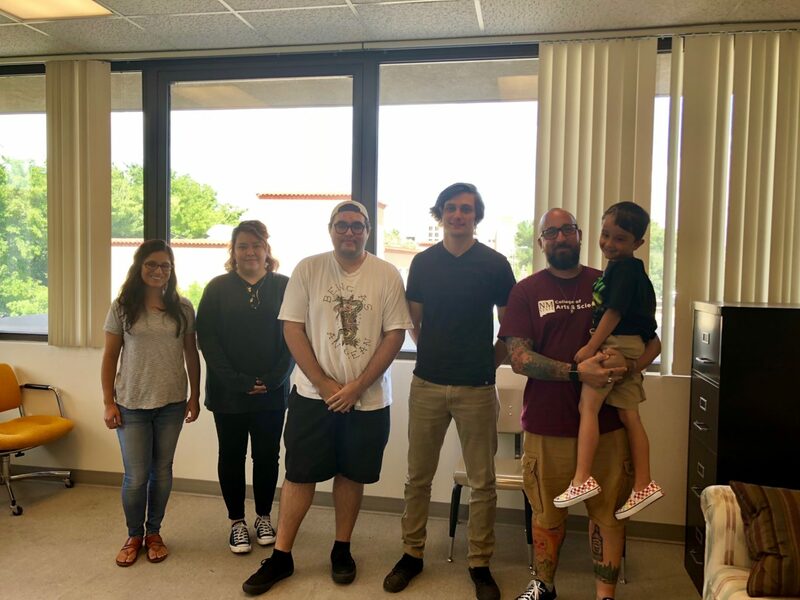 Back row (left to right): Jersain Silva, Ryan Sams, Arryn Robbins, Collin Scarince, myself, Jorge Sanchez, John DesGeorges, and Summer Lileck. 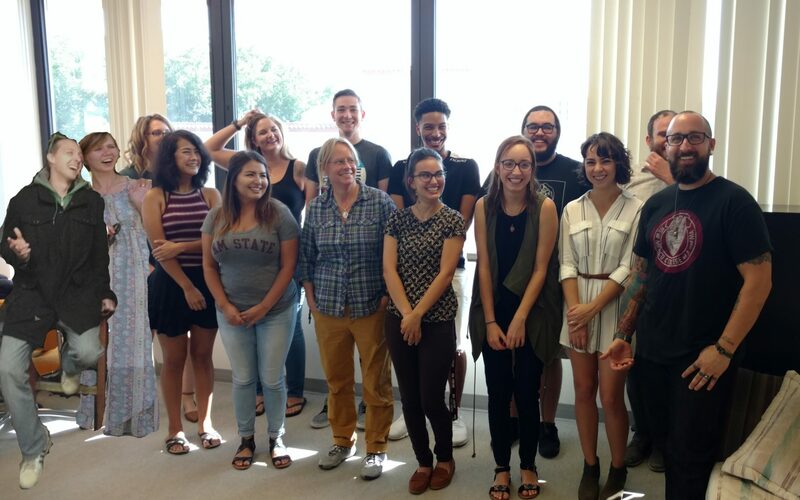 In front (left to right): Annette Enriquez, Jessica Madrid, Angel Ortega, Andrea Sopata, Emily Ericson, and Karime Zubia. 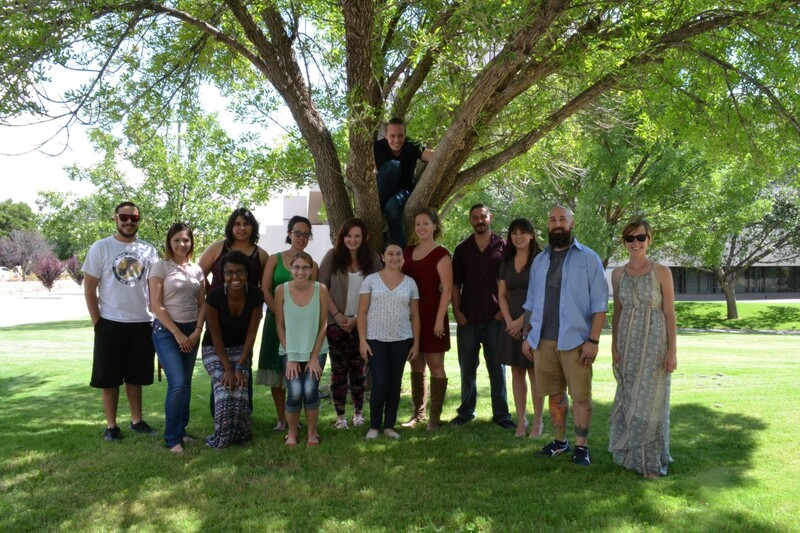 Missing are Carrie Melia, Alexis Lopez, Natalie French, Izza Jauregui, Zoie Scott, and Steven Archuleta. 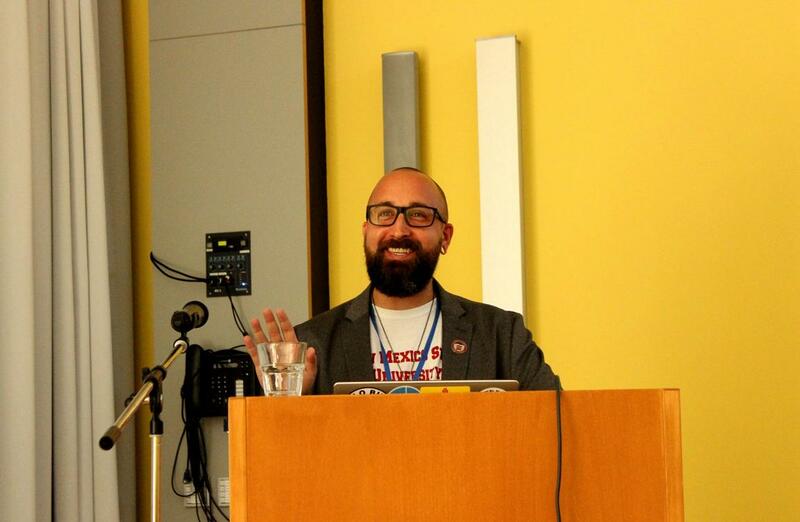 Me presenting our talk on search expertise. 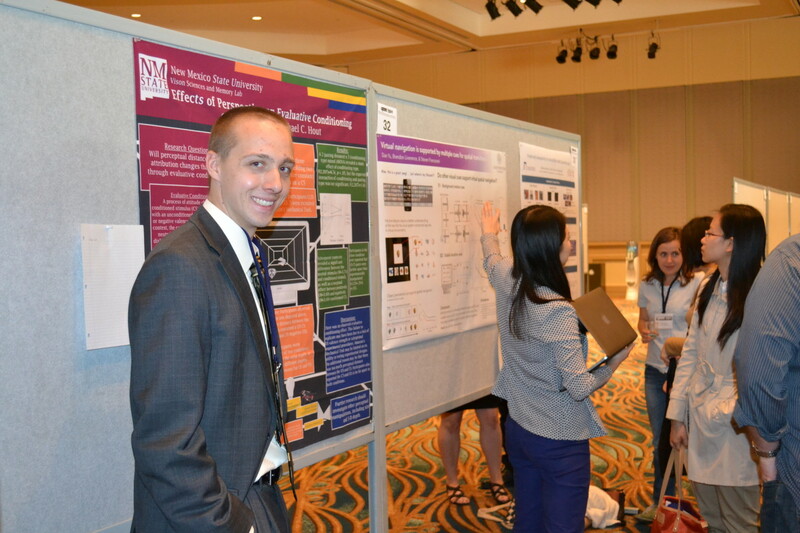 Collin Scarince presenting our poster on gambling expectations/memory. 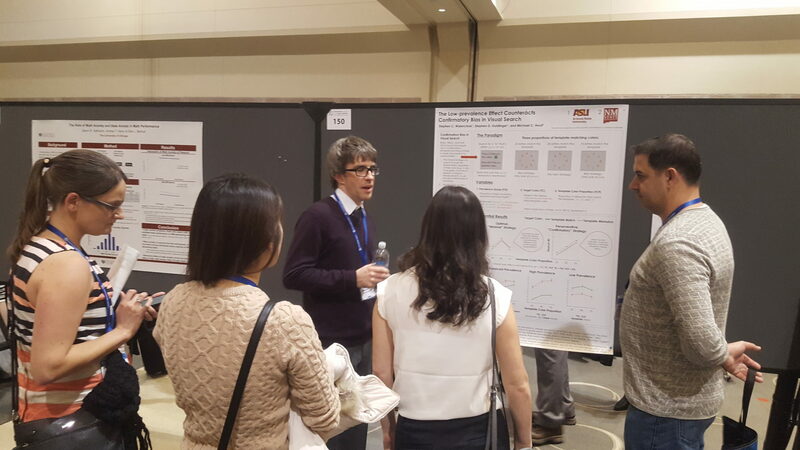 Arryn Robbins presenting our work on multidimensional scaling simulations. 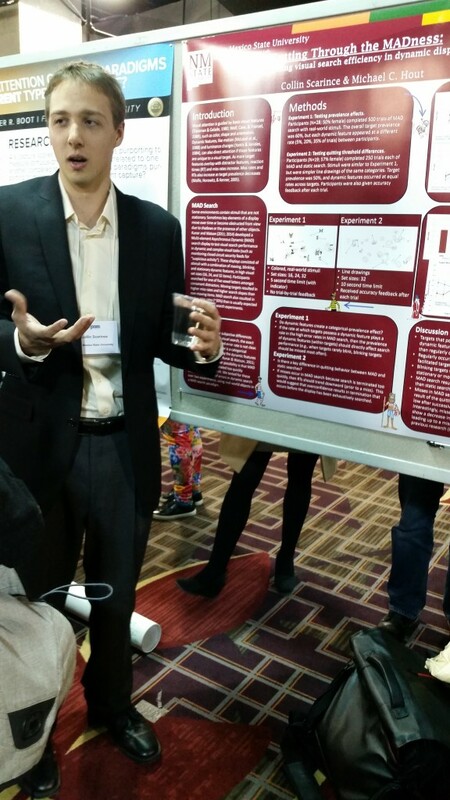 Alexis Lopez presenting our work on collaborative visual search. 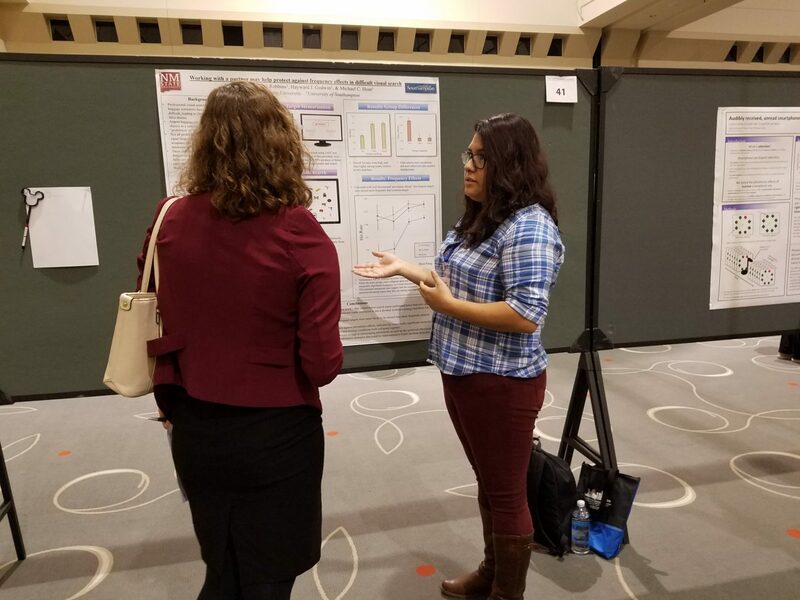 Jessica Madrid presenting our poster on hybrid visual search. 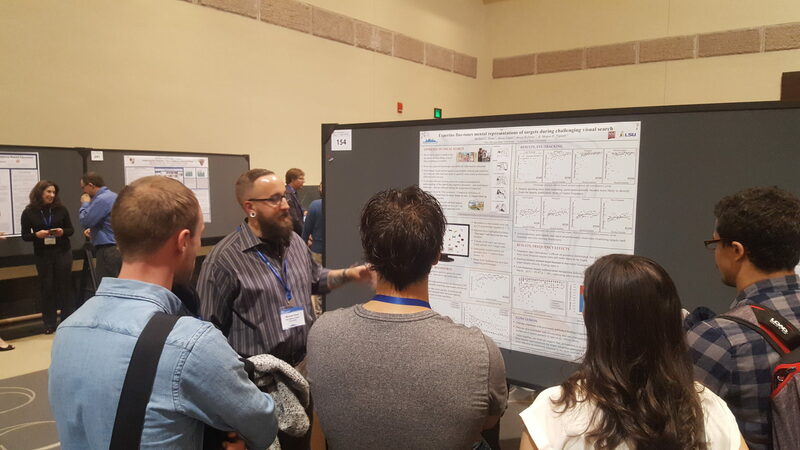 Steve Walenchok (honorary lab member) presenting our work on confirmation bias in visual search. 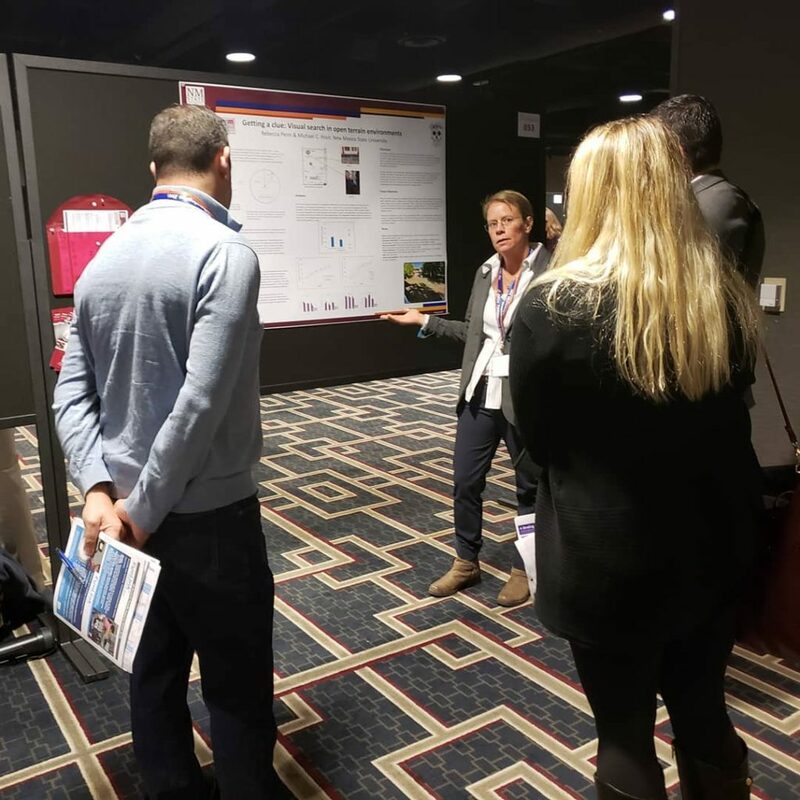 Carrie presenting our poster on the Face Inversion Effect. 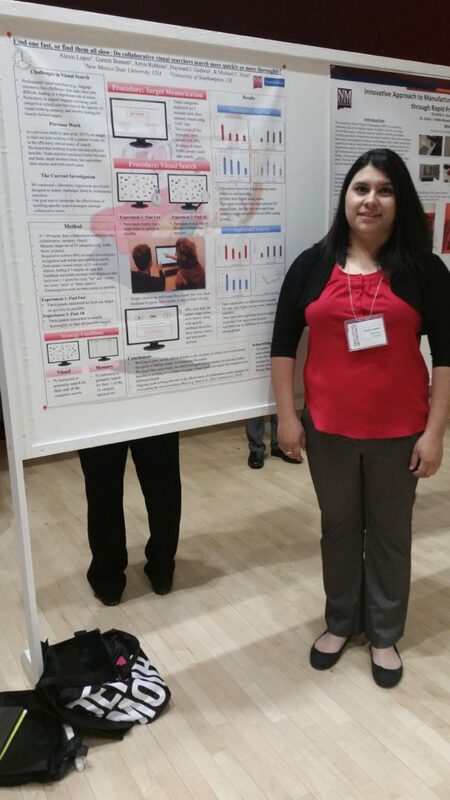 Arryn presenting our poster on hybrid visual search, on behalf of Jessica. 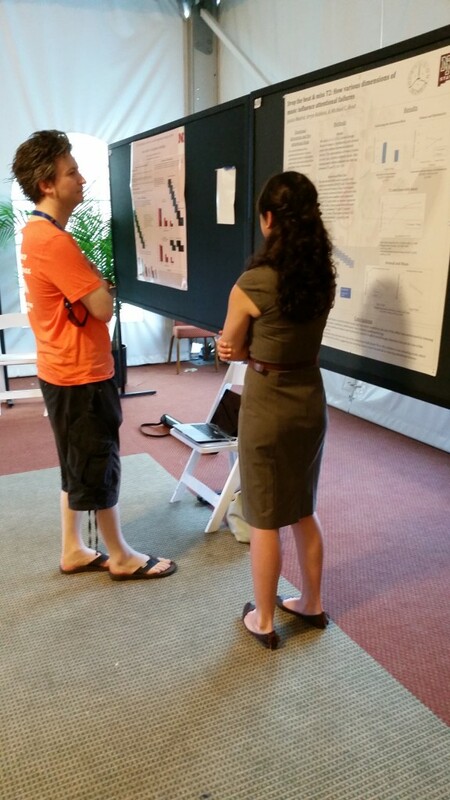 Alexis presenting our poster on collaborative visual search. 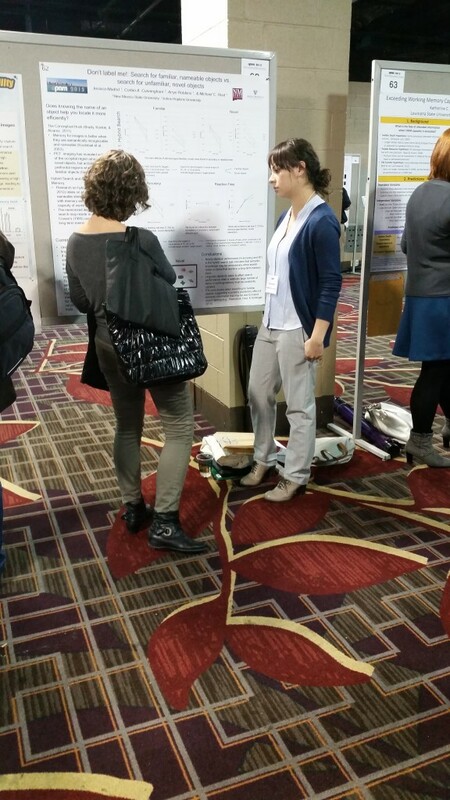 Presenting our poster on pupillometry and the low-prevalence effect, on behalf of Maggie. 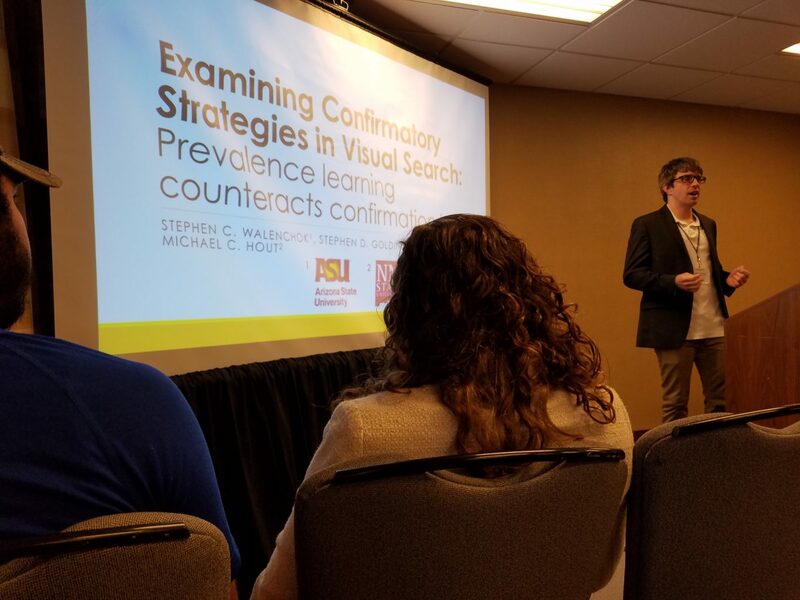 Steve Walenchok (from ASU; an unofficial lab member) presenting our work on confirmatory strategies in visual search. 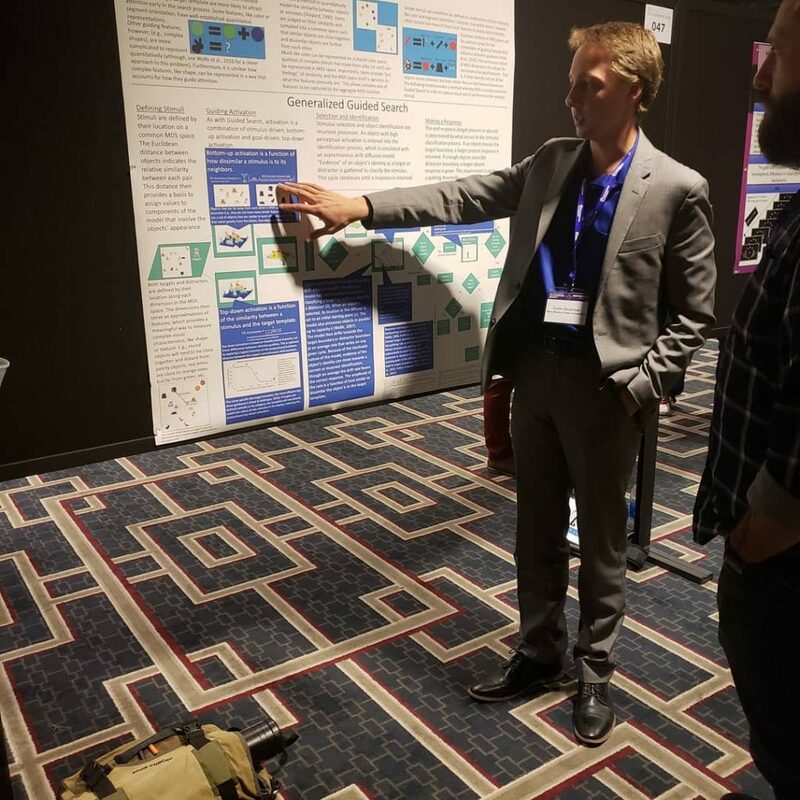 Collin presenting our poster on dynamic visual search. 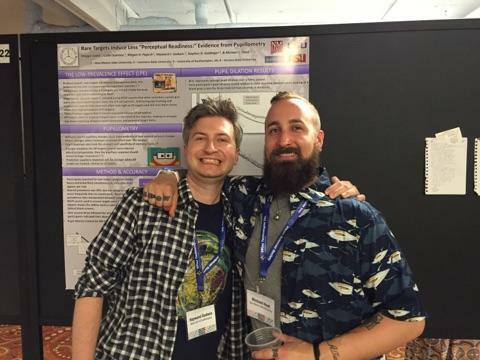 With Hayward Godwin, another unofficial lab member, at one of our posters. 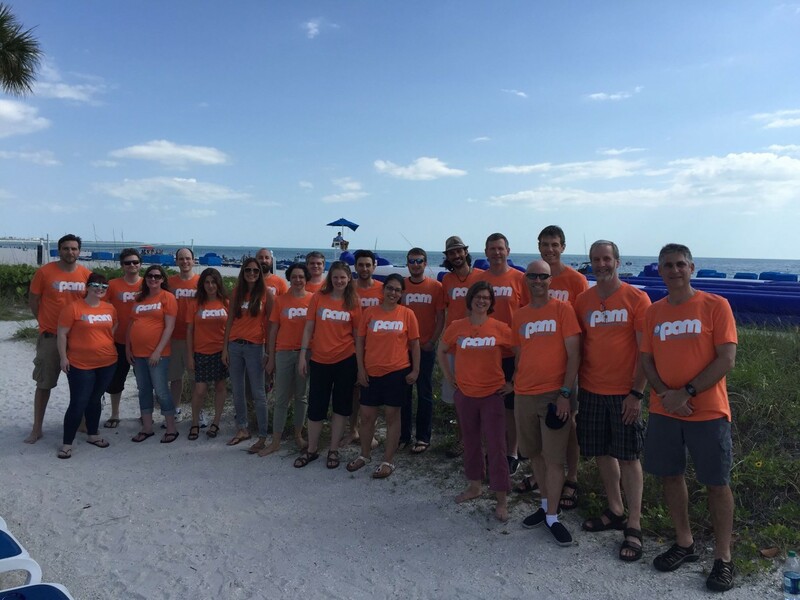 OPAM organizers, past and present. 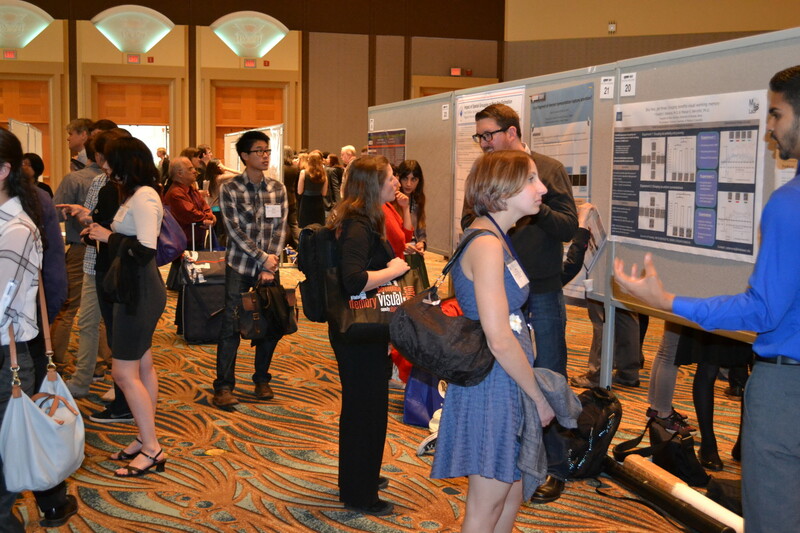 Presenting our micro-talk on individual differences in category typicality and mental representations in visual search. Team building with the lab, Hayward Godwin (University of Southampton), Steve Walenchok (Arizona State), and Tony Barnhart (Carthage College). 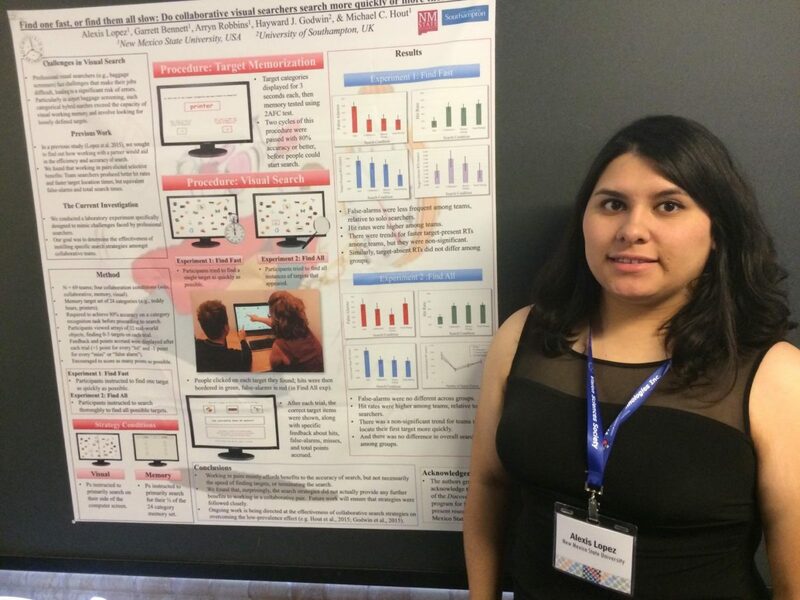 Alexis Lopez, presenting her poster on collaborative visual search. 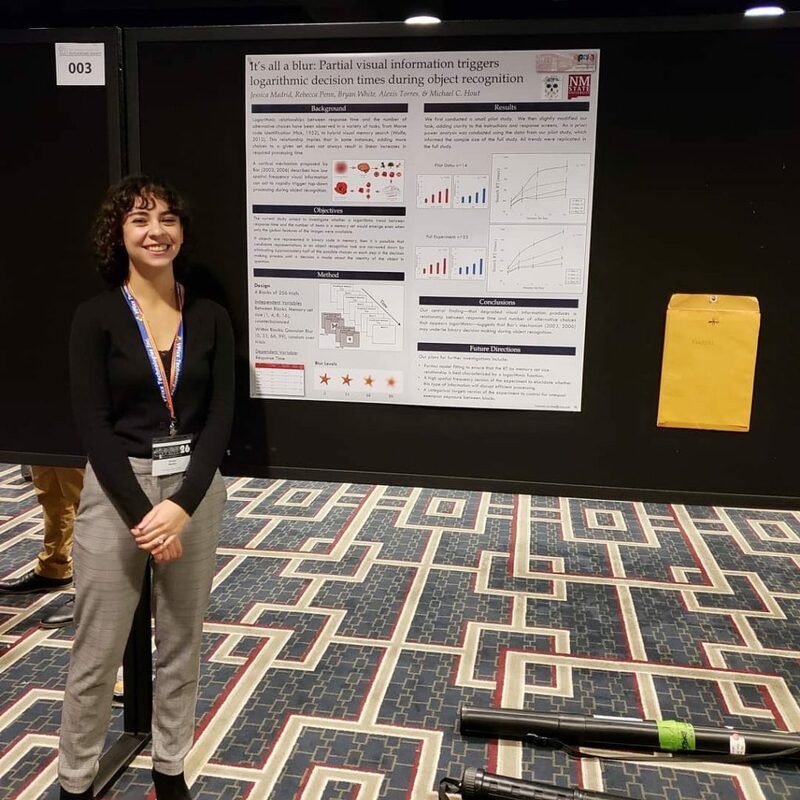 Alexis is a Discovery Scholar, and will also be presenting this work at the upcoming Vision Sciences Society conference. 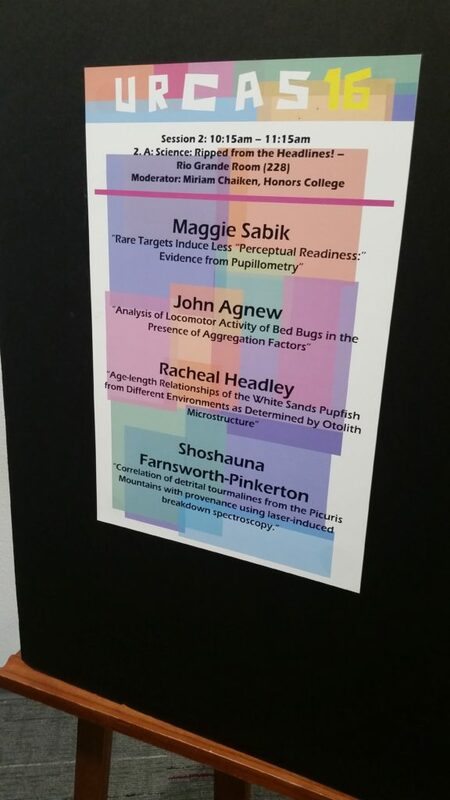 URCAS poster, announcing the schedule for Maggie’s talk session. 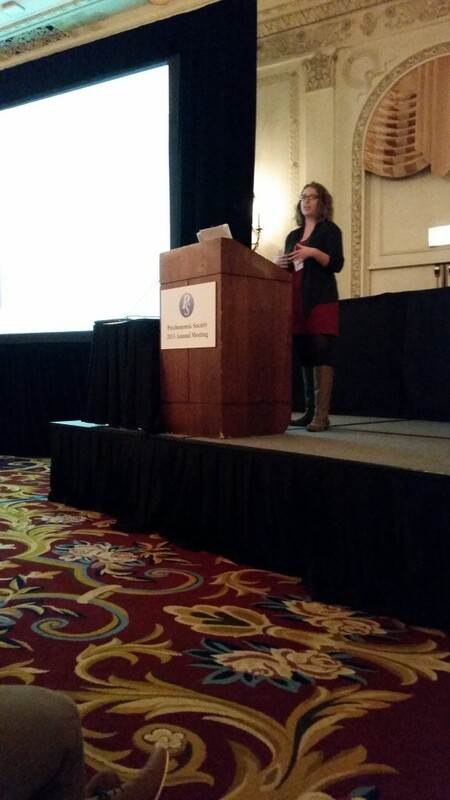 Maggie Sabik, presenting her talk on pupillometry and the low-prevalence effect. 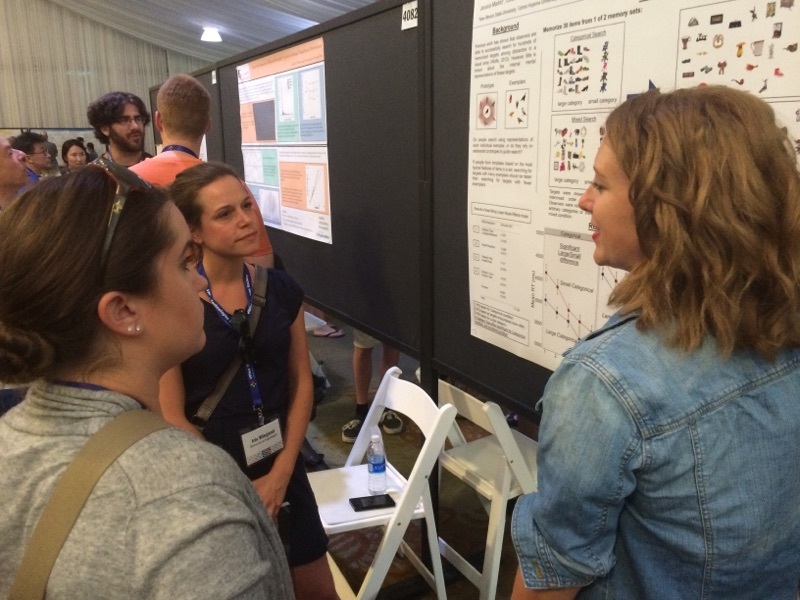 Maggie is a BRAiN scholar, and her work will also be presented at this year’s Vision Sciences Society conference. 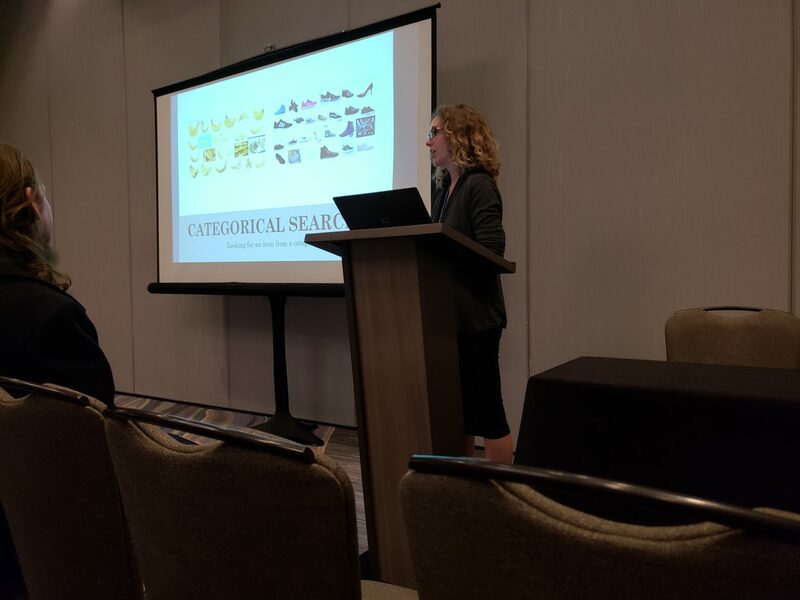 Arryn, doing a great job on her first conference talk (at OPAM) on categorical search. She nailed it! 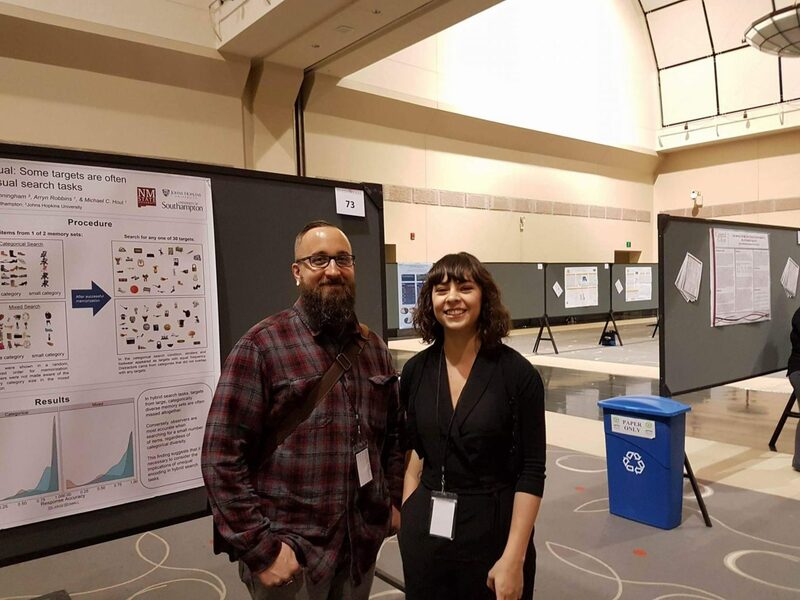 Our undergrads, Alexis and Garrett, presenting their first ever poster (at OPAM), on collaborative search. 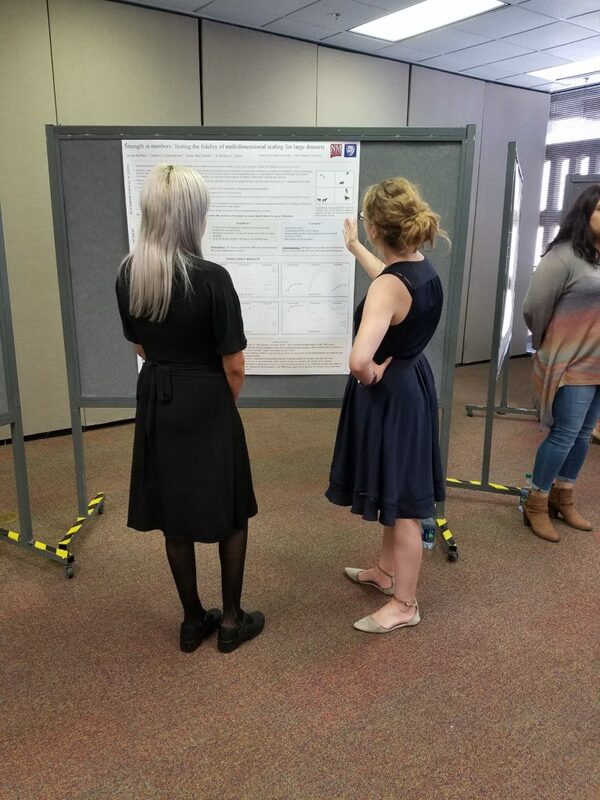 Jessica, presenting her poster (at OPAM) on the effects of linguistics/labeling in visual search. 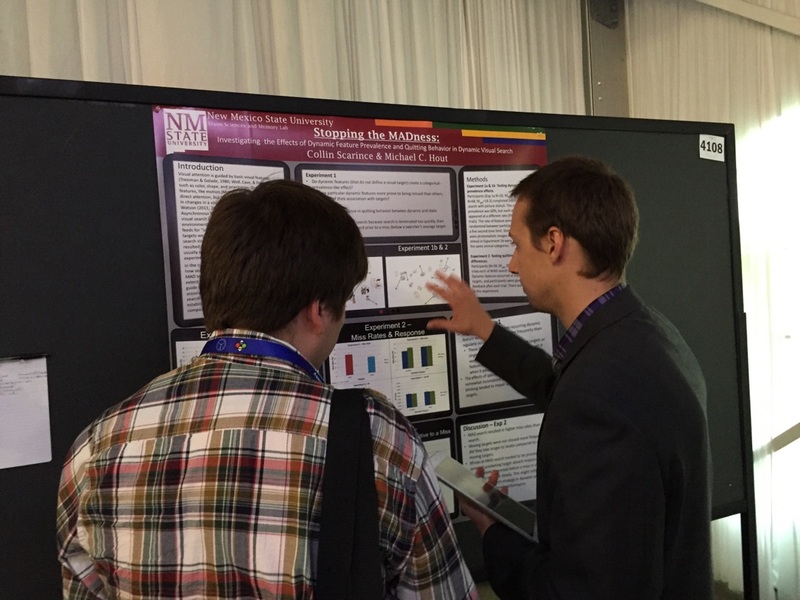 Collin, presenting his OPAM poster on “MAD” search. ow Hayward and I are *both* former OPAM organizers! 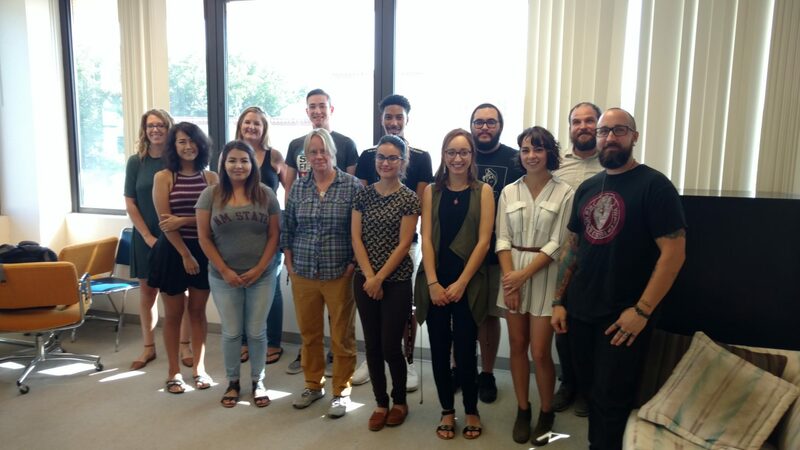 Here are a couple pictures of our lab members from Fall of 2015. 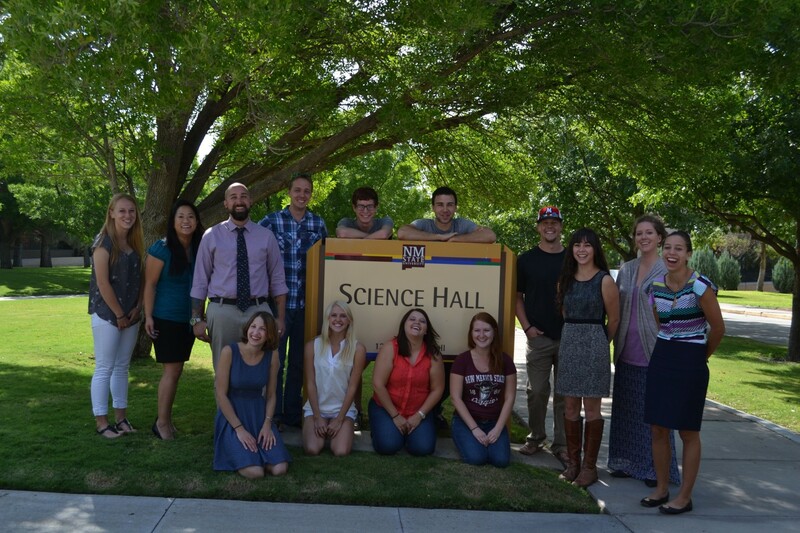 Here are most of our excellent undergraduate research assistants, and the graduate students. …trying to dodge the hawks. 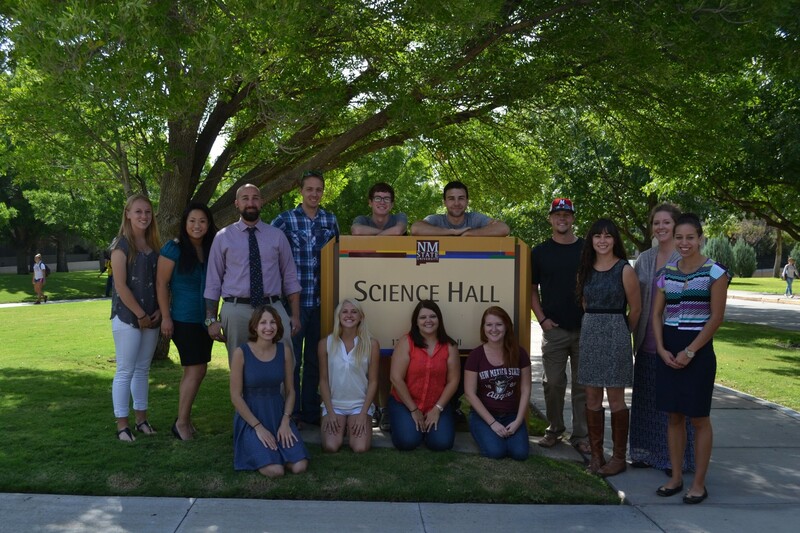 …most of the lab (missing a few people for scheduling conflicts). 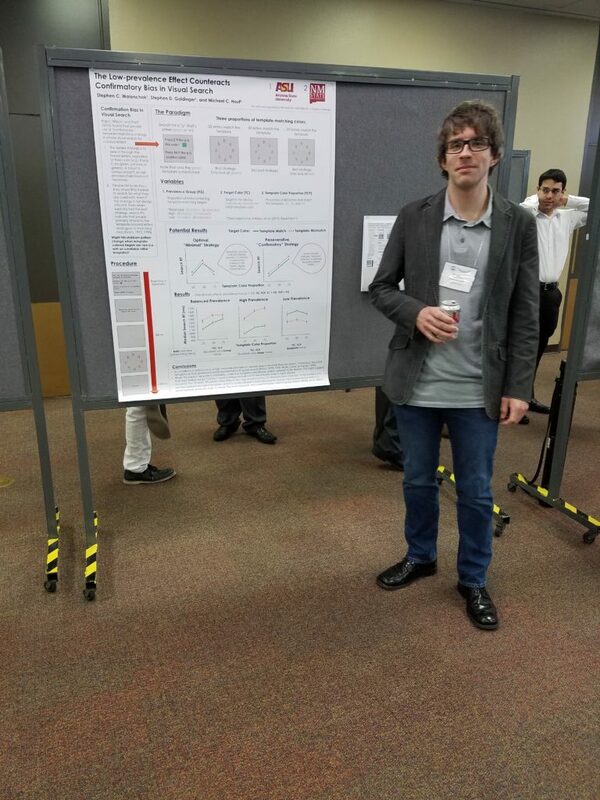 Presenting my poster on object recognition processing in dual-target search. 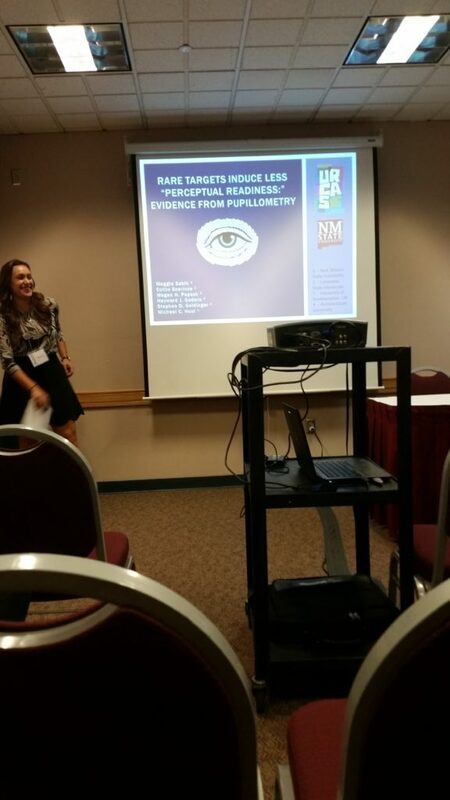 Jessica presenting her work on music and the attentional blink. 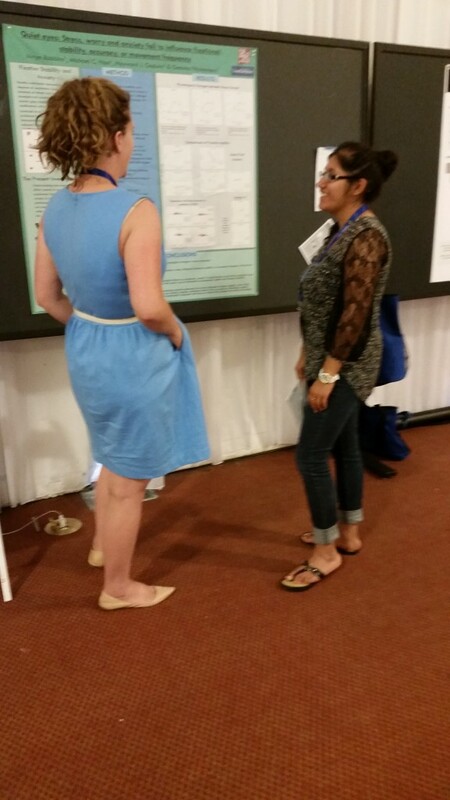 Arryn presenting her poster on stress and fixational stability. 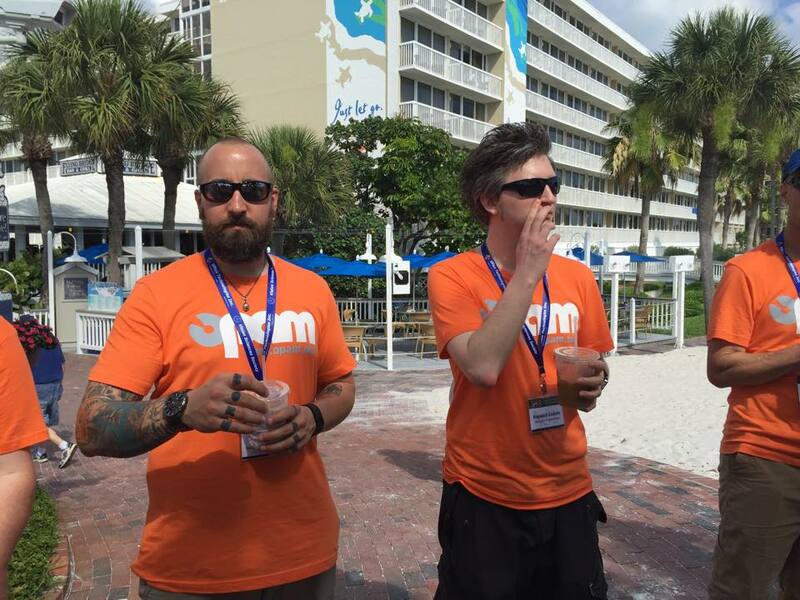 Partners in crime… me and Hayward at the OPAM gathering, plotting and such. Hayward is basically an honorary member of the lab. 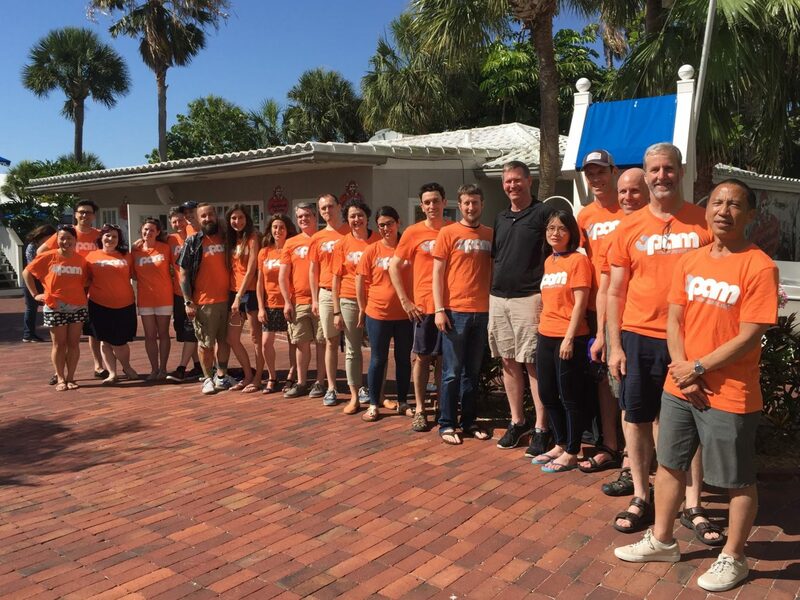 Many of the former OPAM organizers, plugging the conference. 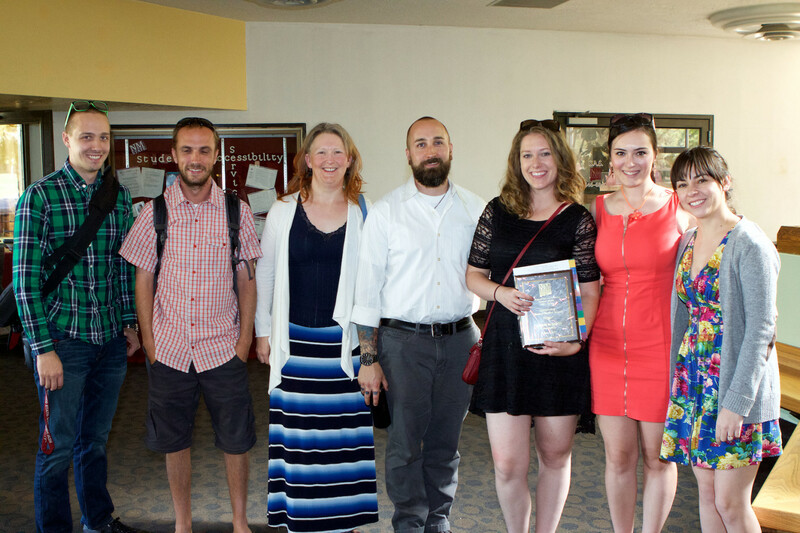 At the College of Arts and Sciences Awards reception with (from left to right) Dr. Laura Madson, Jessica, Arryn, and my girlfriend, Allison. 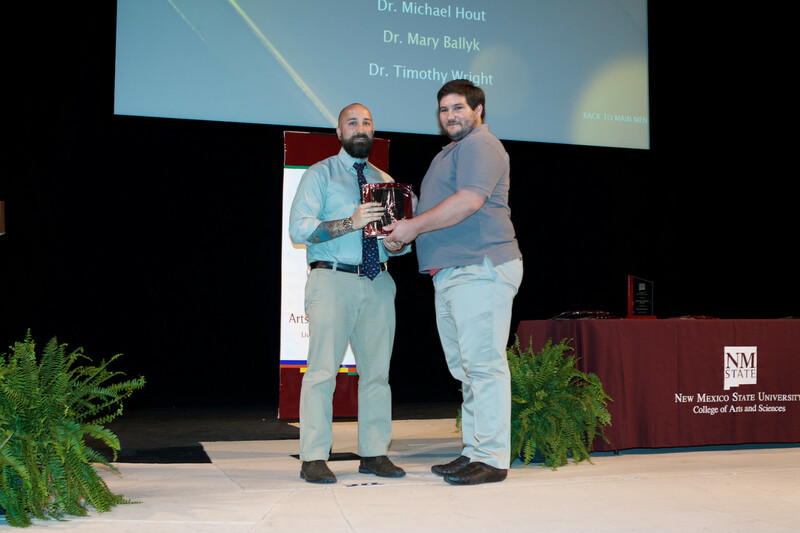 Receiving the award from Mitch Fowler, of the Creative Media Institute at NMSU. 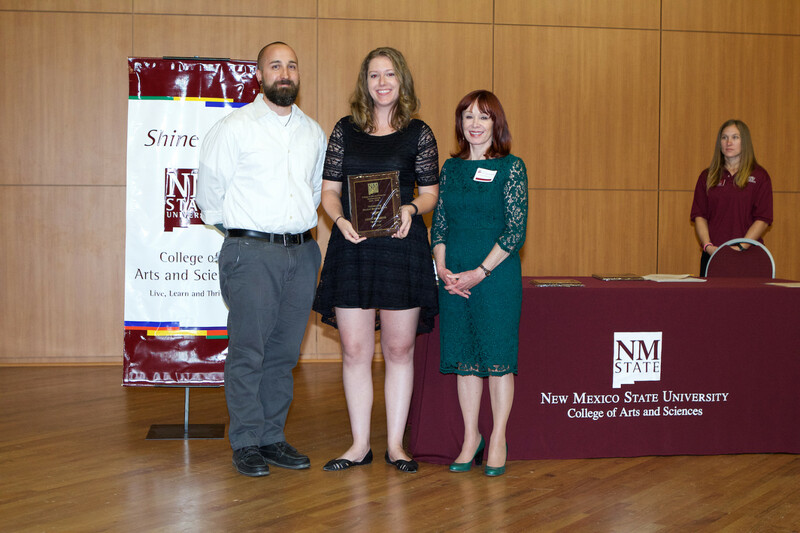 At the College of Arts and Sciences Student Awards (with Dean Slaton), where Arryn got an award for Outstanding Service. At the award reception with Collin, Adam, Laura, Yuliana, and Jessica. 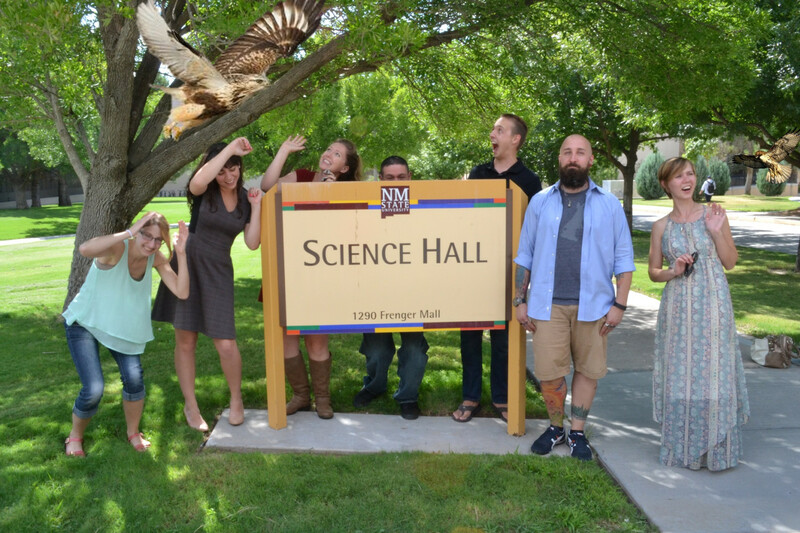 Here are a couple pictures of our lab members from Fall of 2014. 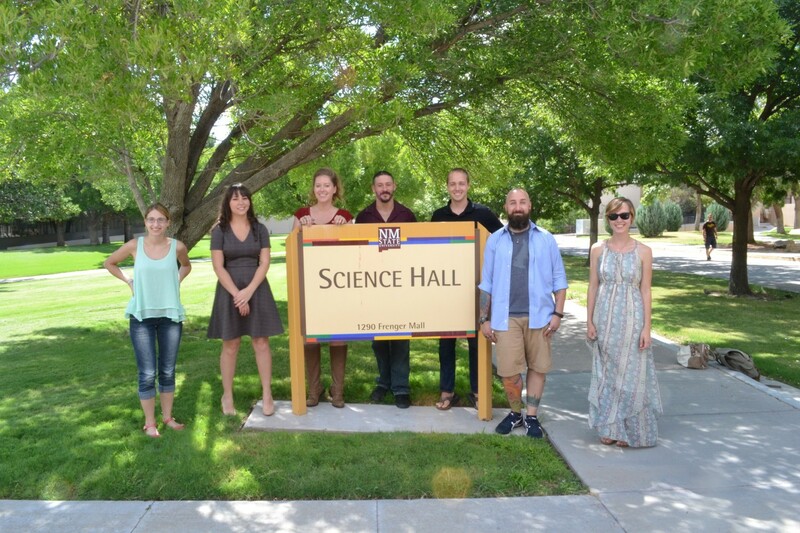 …most of the lab (missing 1 grad student and 6 research assistants). 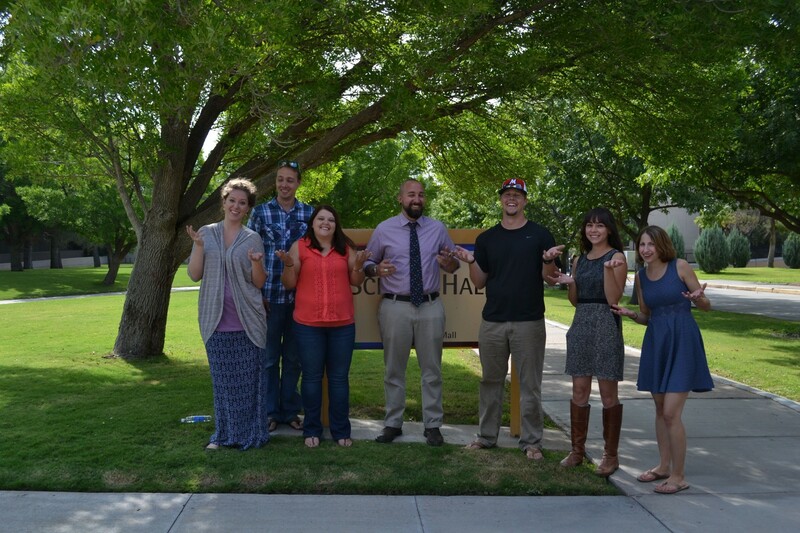 …trying to figure out what to do with our hands. 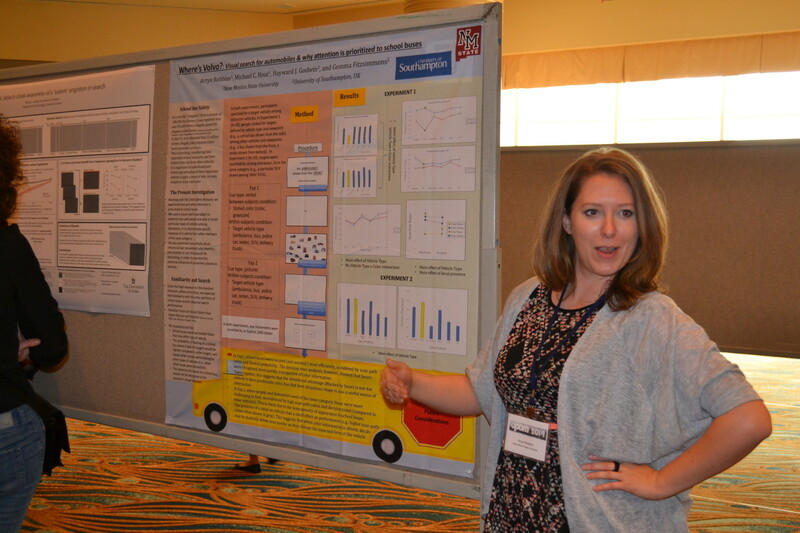 Arryn, proudly presenting her first poster on vehicle search. 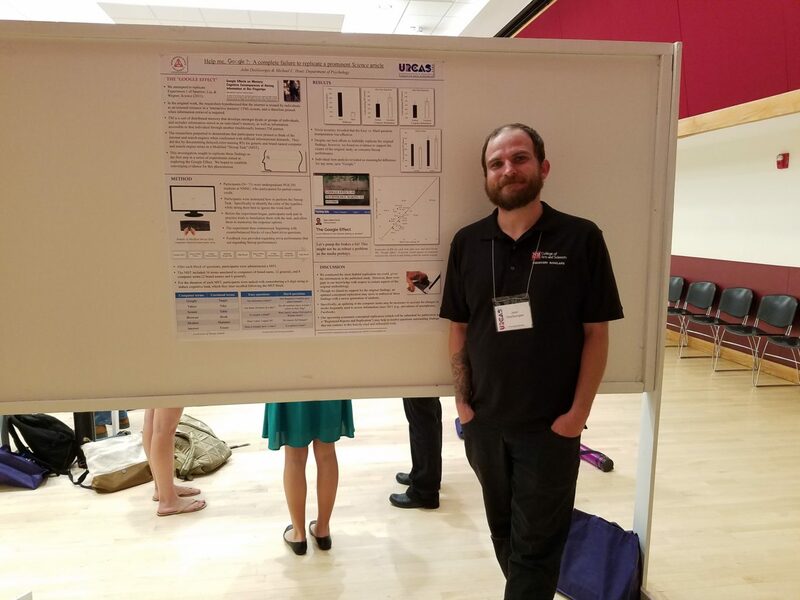 Collin presenting his first poster; his work on evaluative conditioning. 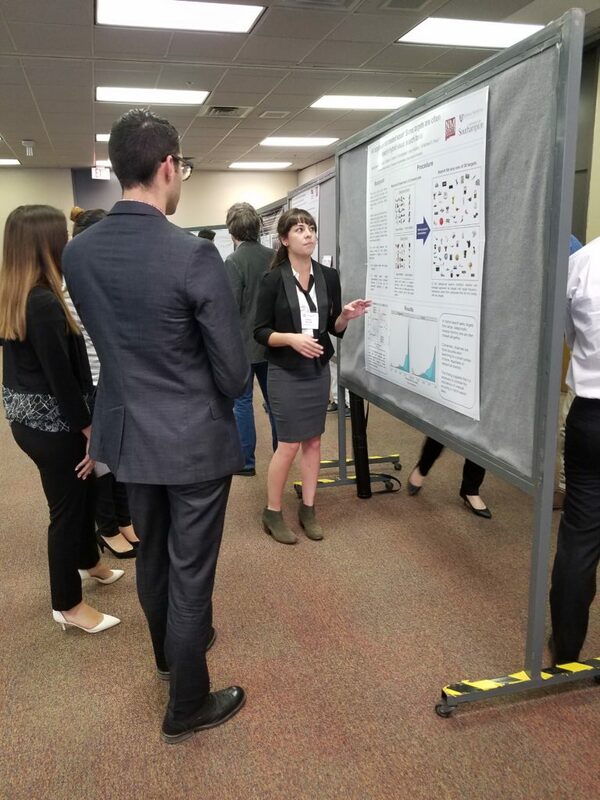 I was skeptical of Ileana Ratiu’s poster… which is weird, considering I’m an author. Carrie, soaking it all in. 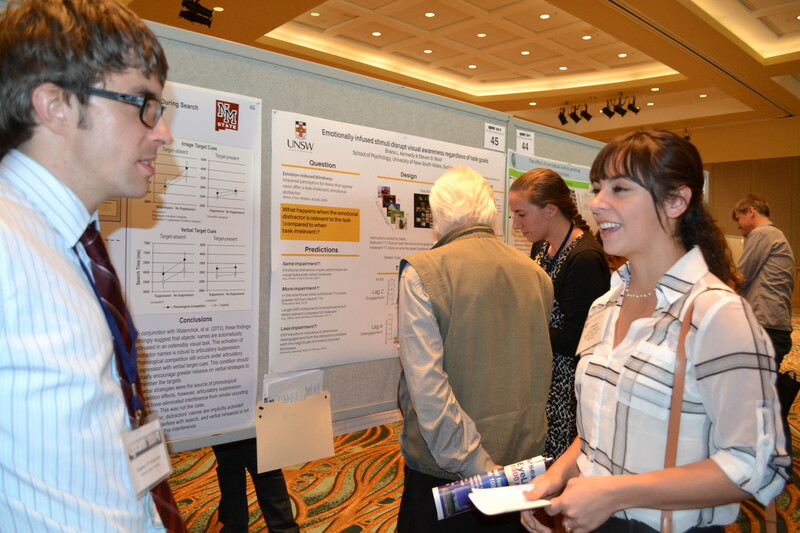 Jessica, getting the scoop from one of our collaborators, Steve Walenchok. 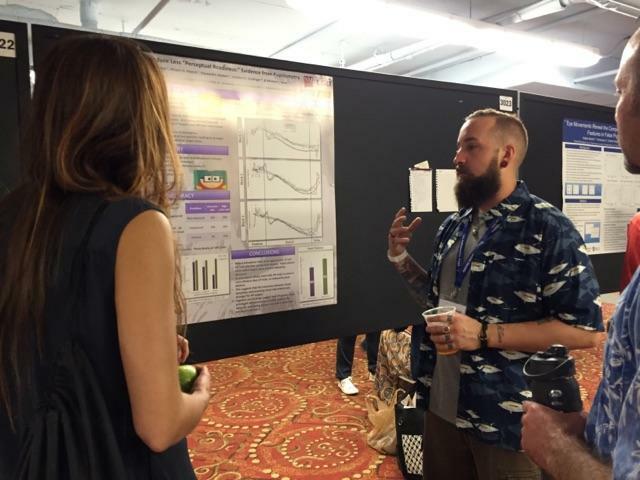 Me, doing my poster at Psychonomics. Jessica, plotting to fill up those blank poster boards with her own work. 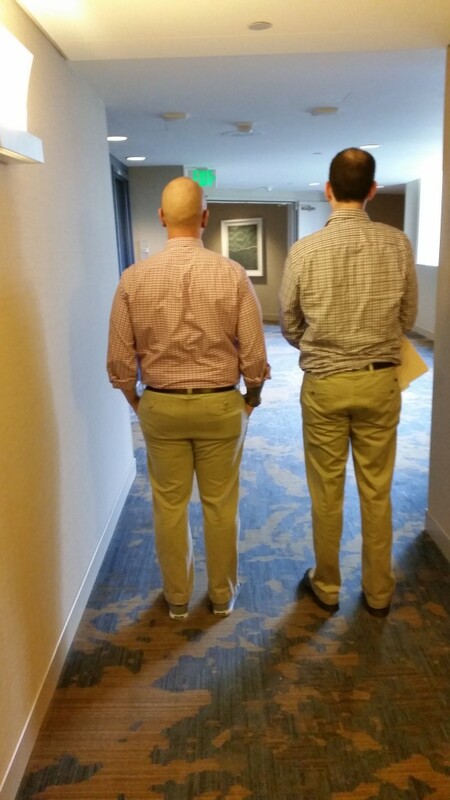 Goodbye, OPAM conference… it’s been a fun two years, but Jeff and I hope you’re happy to see the back of us. Don’t worry, we’ll dress alike next year too.